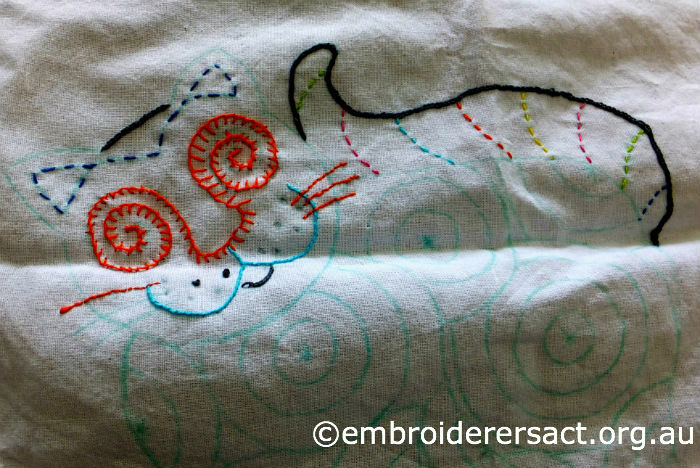 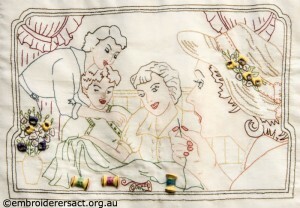 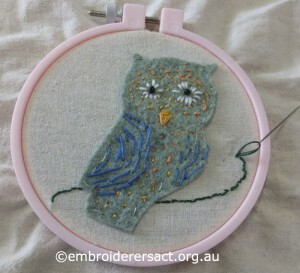 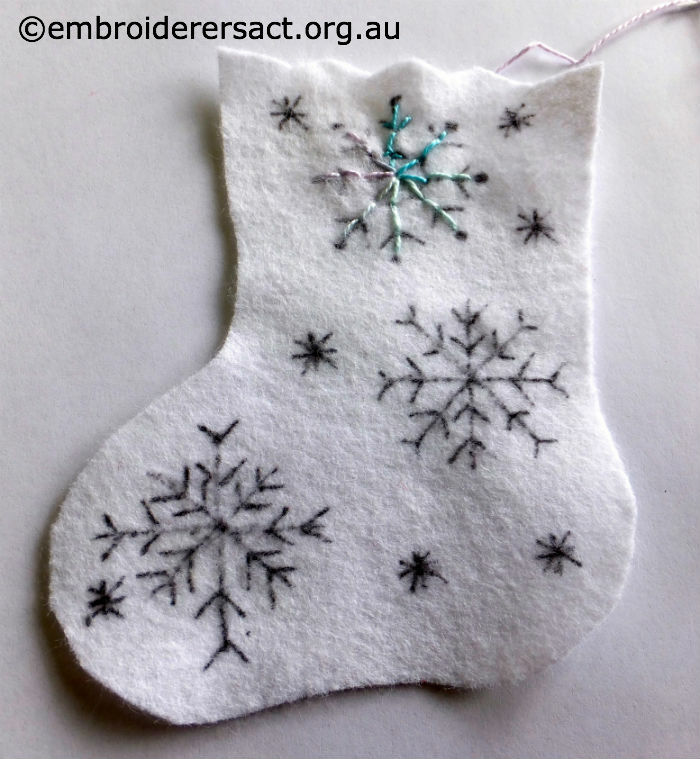 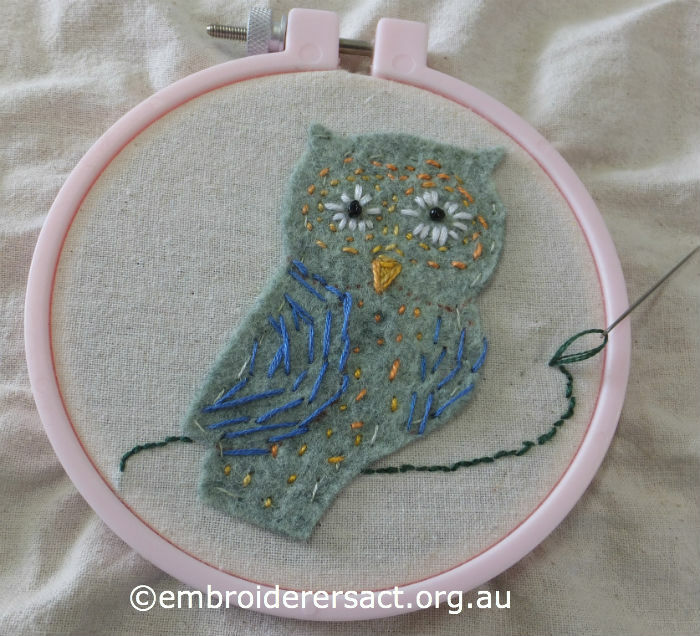 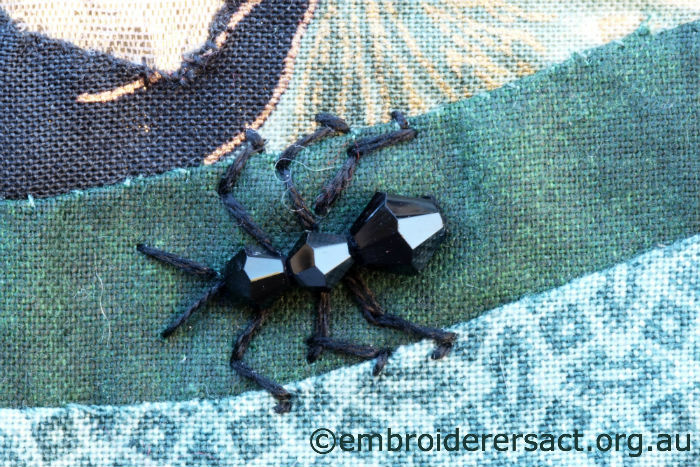 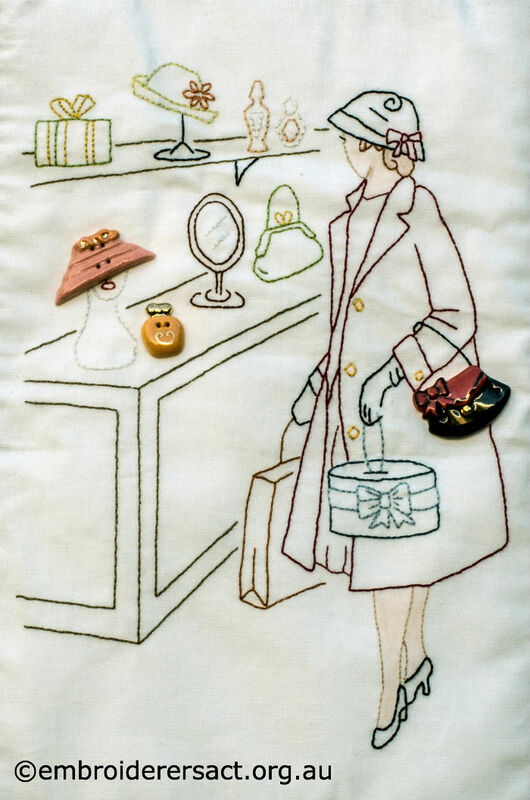 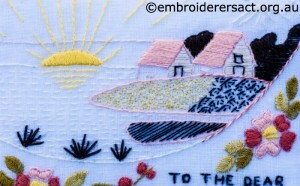 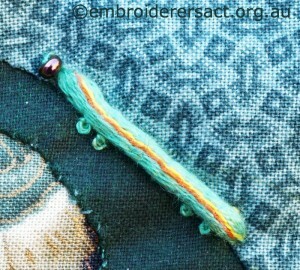 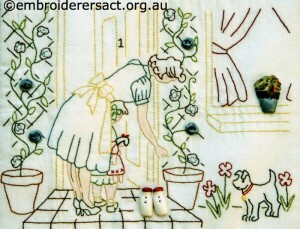 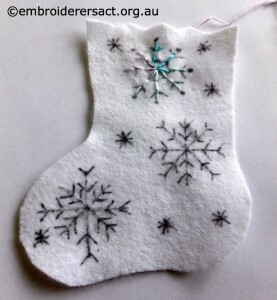 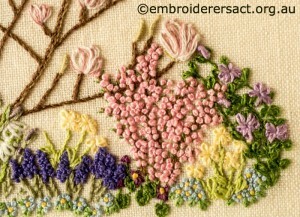 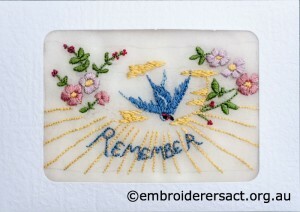 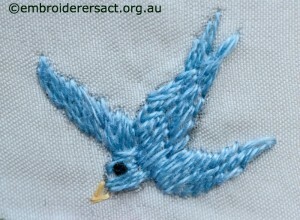 Hope you’re having a fun weekend with some time for stitching. 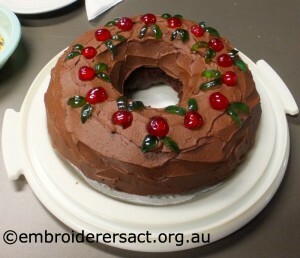 Here’s some eye candy for you to enjoy with a cuppa or a glass of your favourite drink. 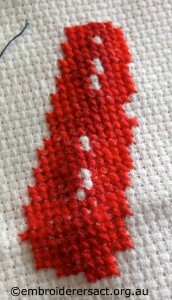 Now I’m taking a chance in sharing this next piece with you. 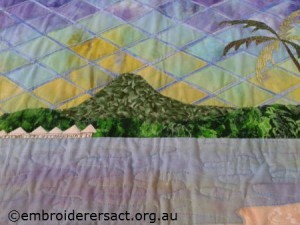 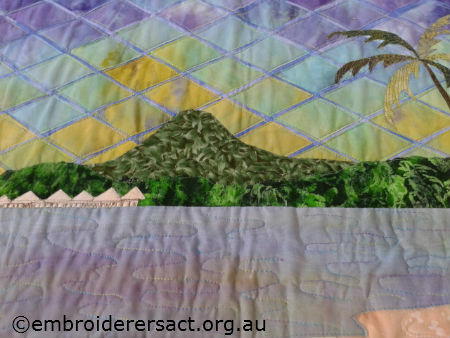 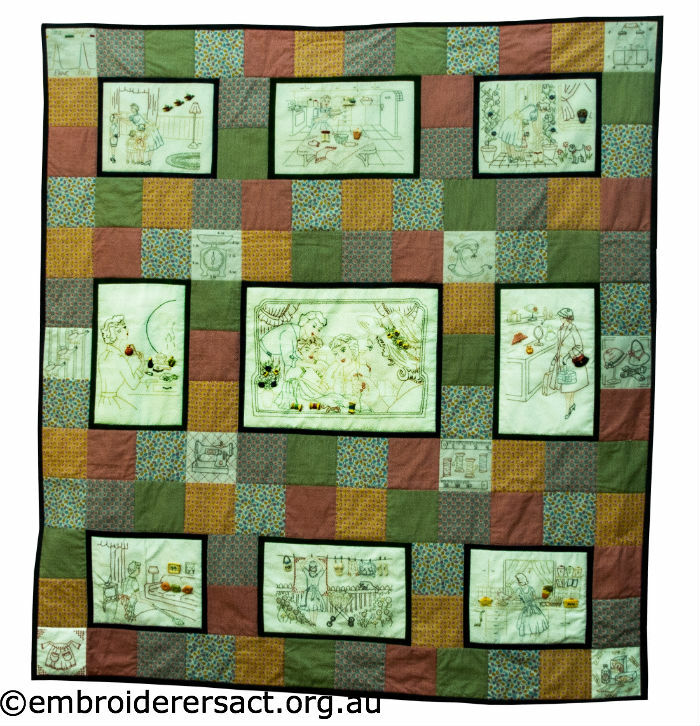 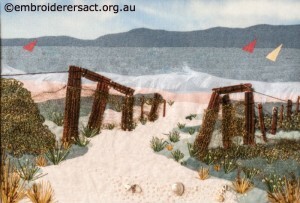 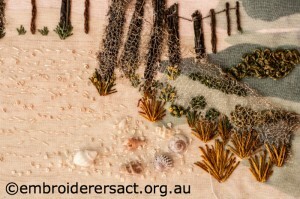 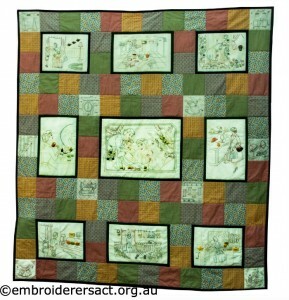 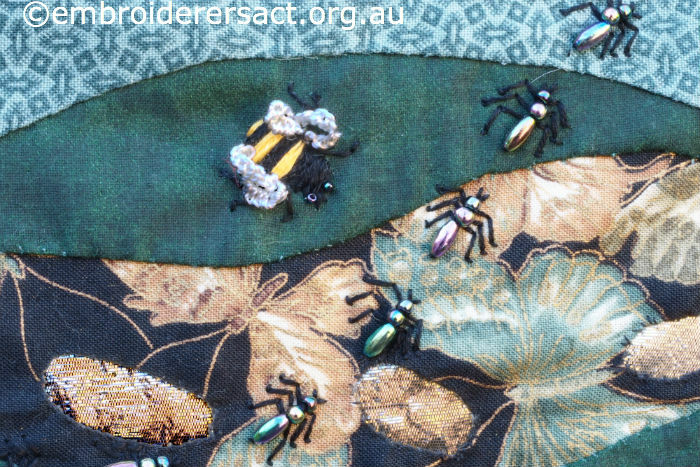 I’m currently in North Queensland visiting family and I’ve been very lucky to enjoy a wonderful Elizabethan Panel designed and stitched by my sister-in-law Jennifer. 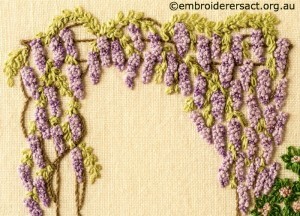 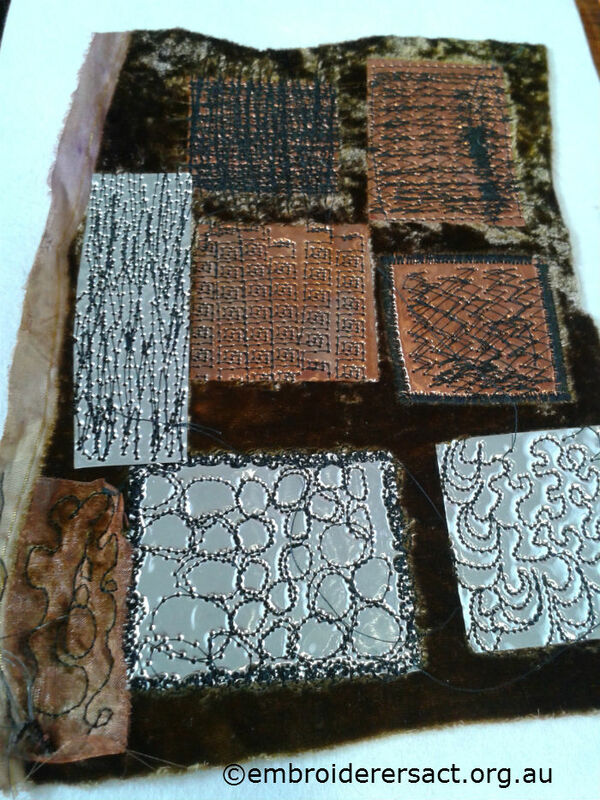 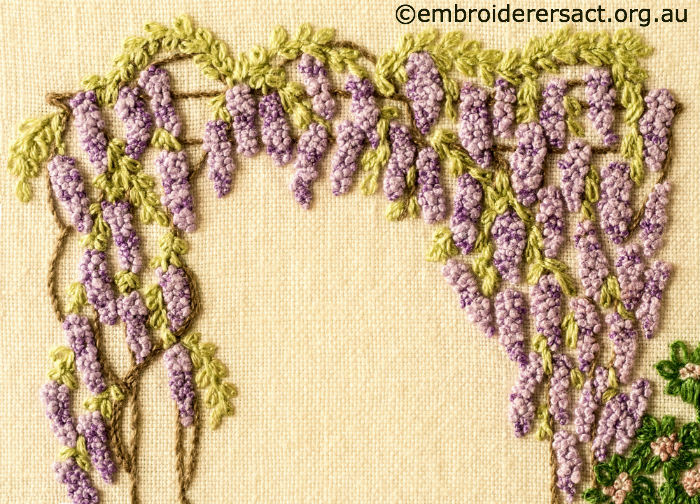 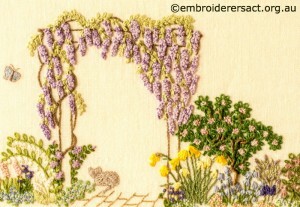 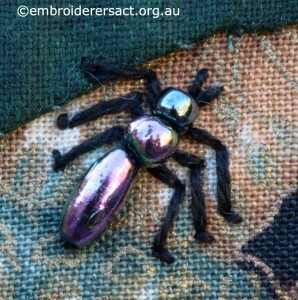 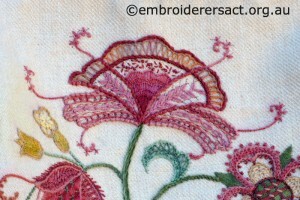 It’s done in silk threads on silk and measures 1.55m by 0.6m so it’s an amazing work. 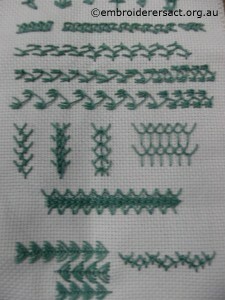 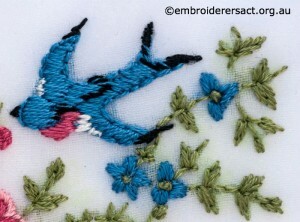 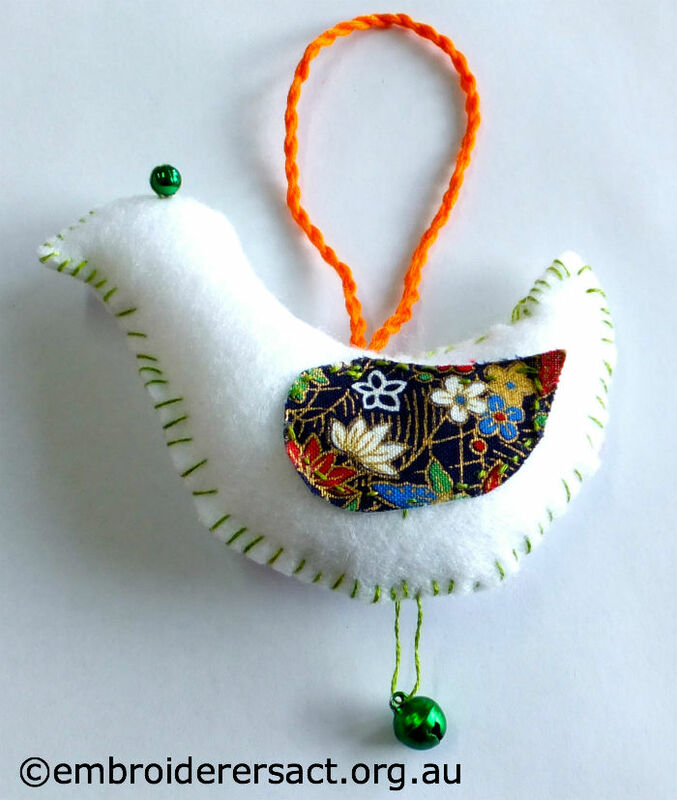 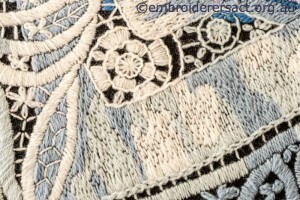 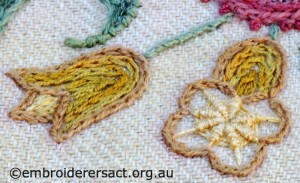 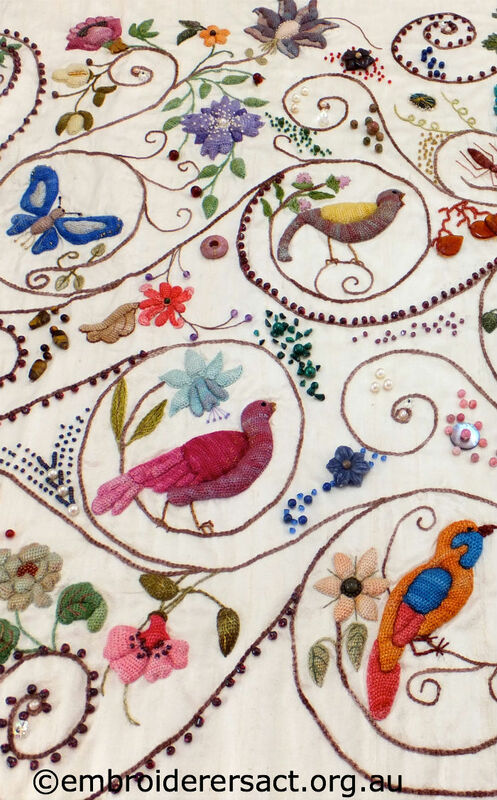 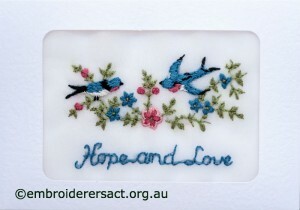 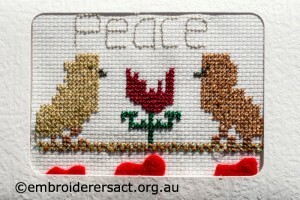 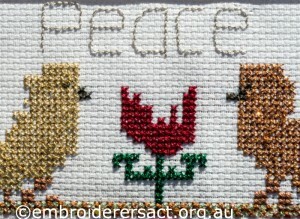 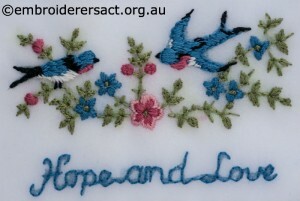 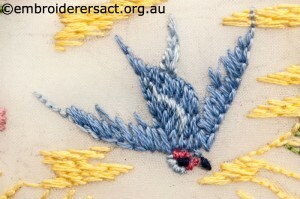 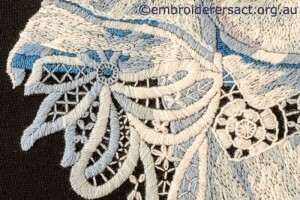 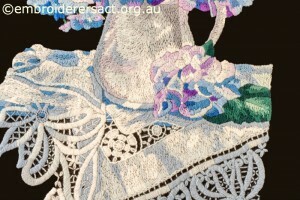 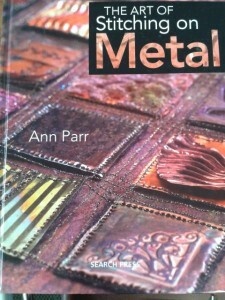 The central design revolves around 14 birds in padded needlelace. 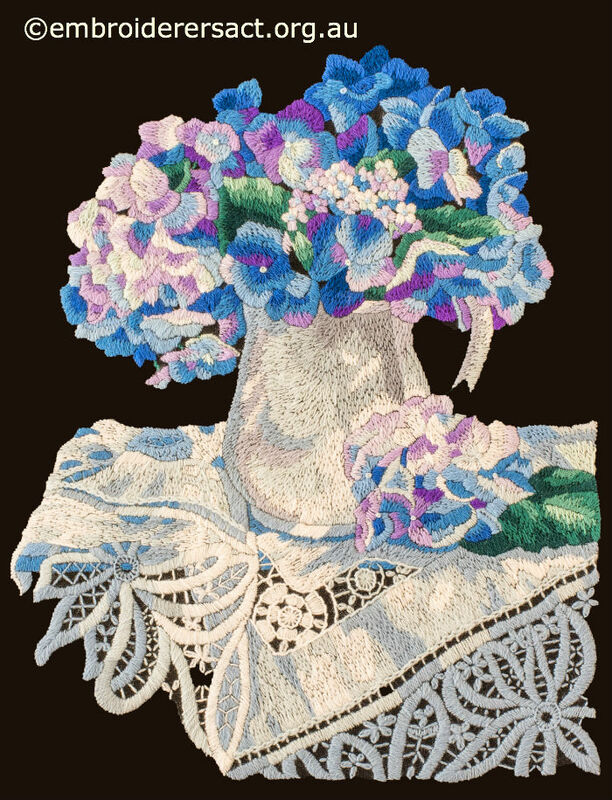 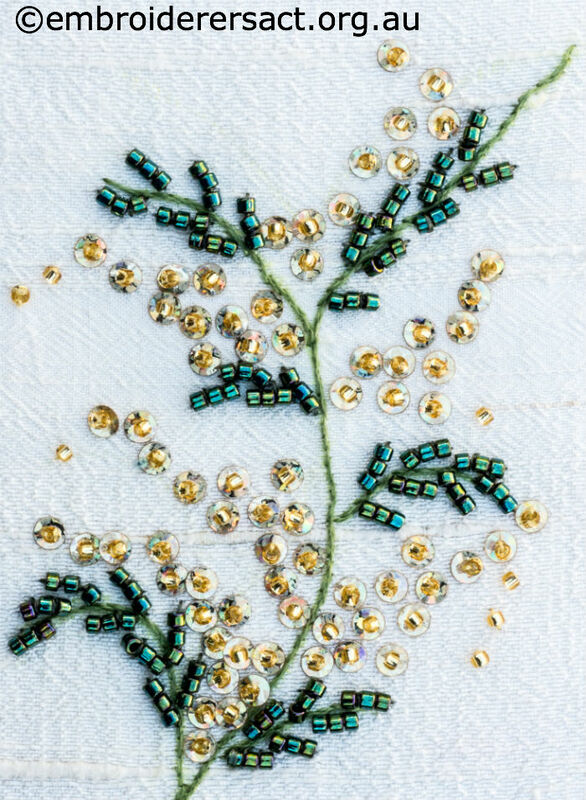 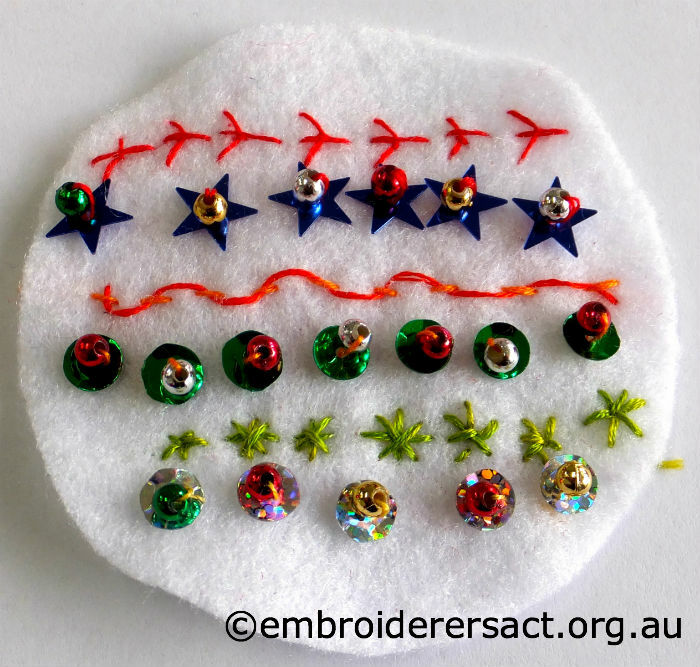 This embroidery is a tour de force and is embellished with an awesome selection of antique beads and gemstones. I hesitated to show it to you because it’s not yet blocked and stretched and because the photos are taken with my point and shoot camera – so there’s a lot of finessing still to do. 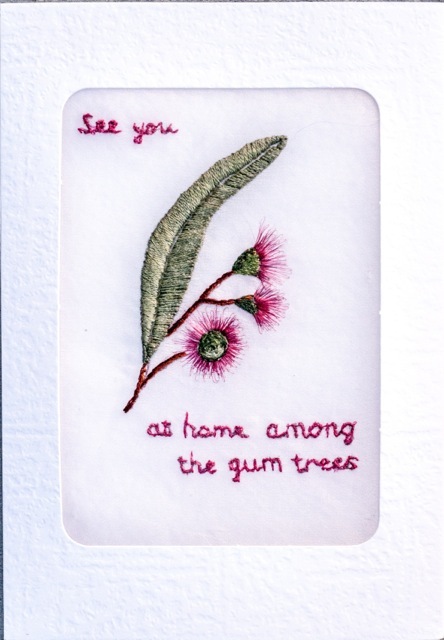 But it’s very doubtful that I’ll ever be able to show you this piece framed and photographed by Stewart Bath as it’s a long way from the Atherton Tableland to Canberra. So I’ve decided to jump in and share some small design elements. 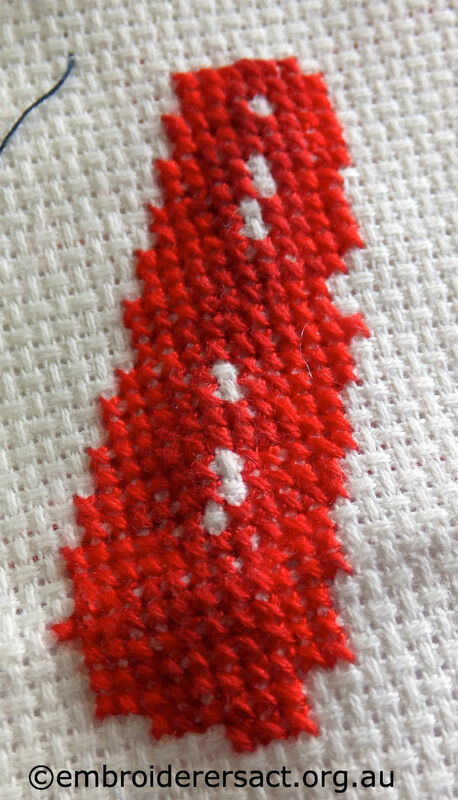 Cross fingers, toes and everything else that we might be able to share the whole piece sometime in the future! 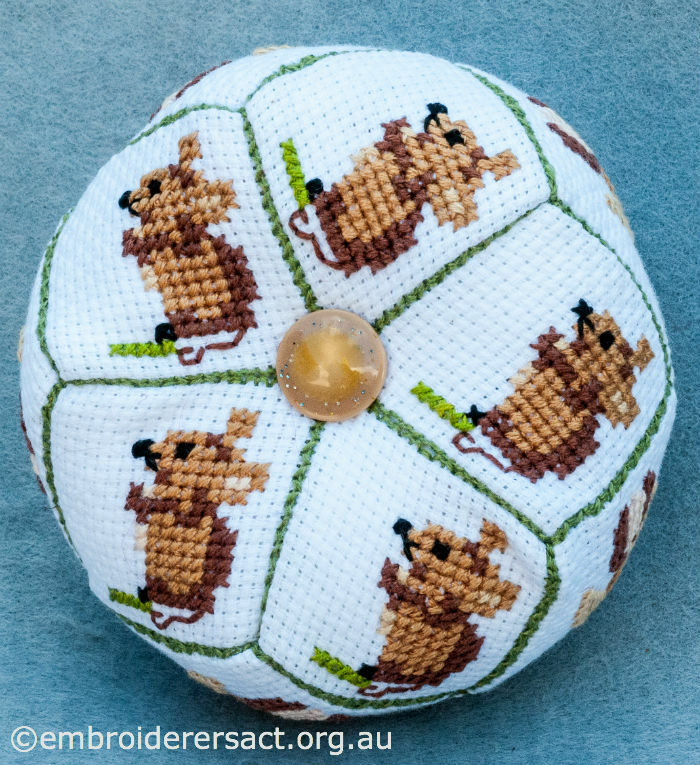 Those of you who read this blog regularly know that Stewart and Jillian Bath are crucial to making it possible because they take care of the photography. I’m always at their home delivering work to be photographed or picking up pieces to be returned to owners. 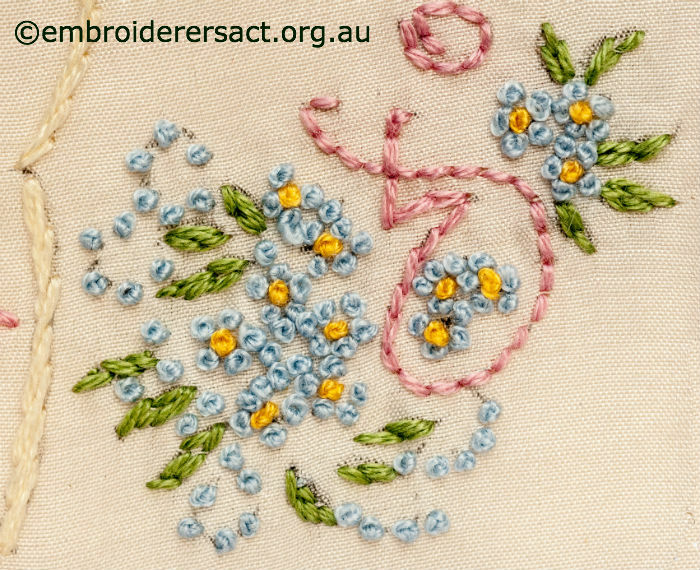 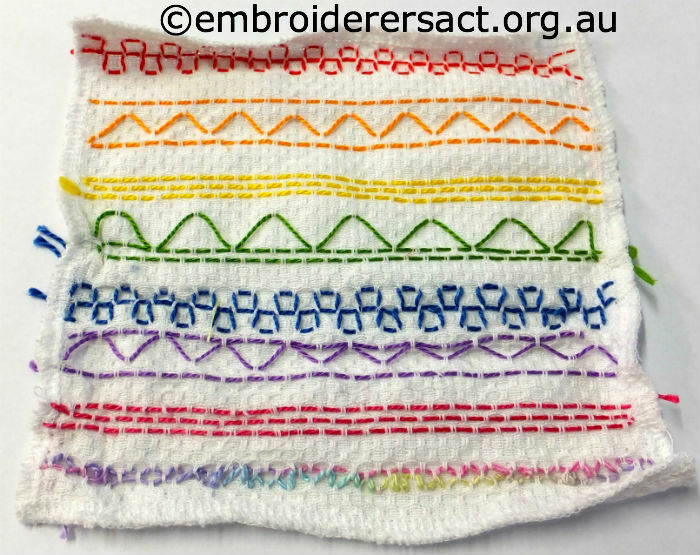 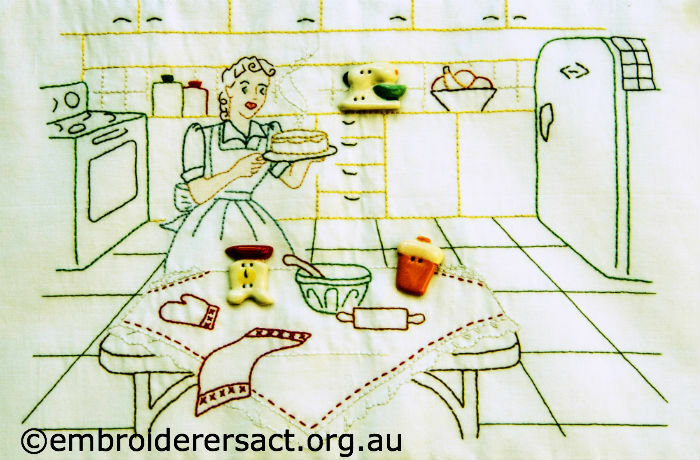 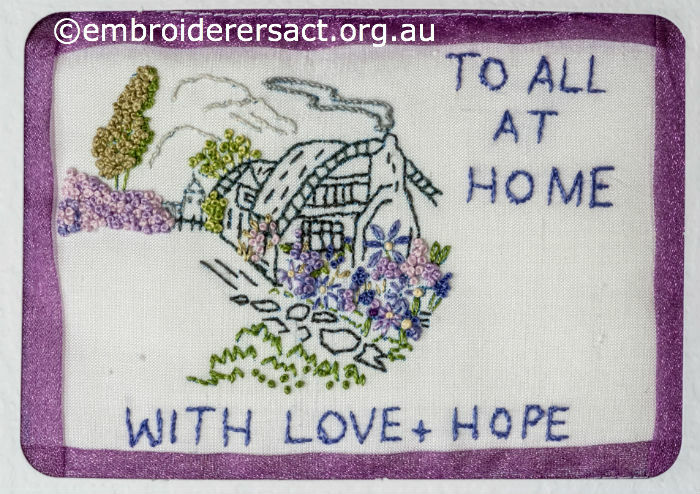 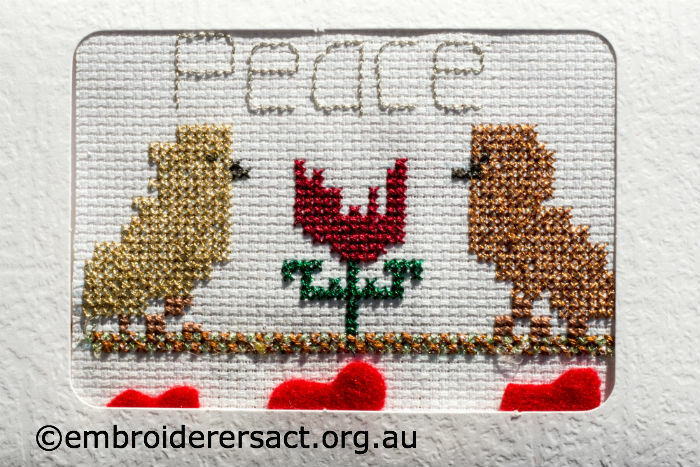 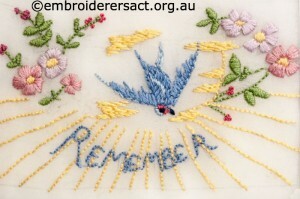 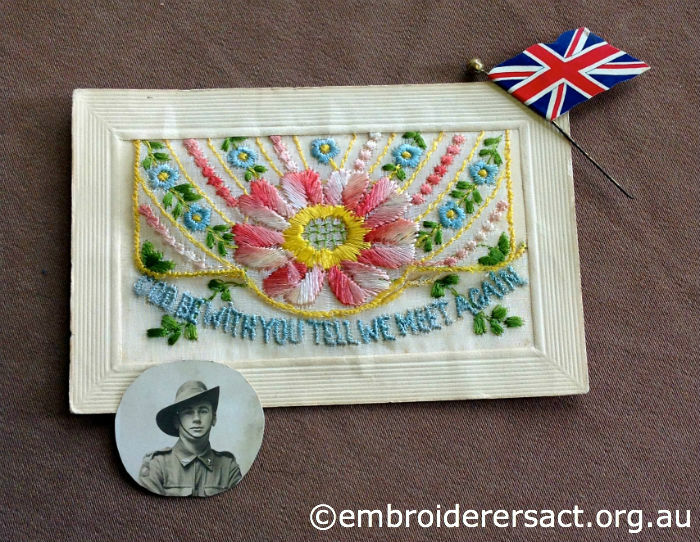 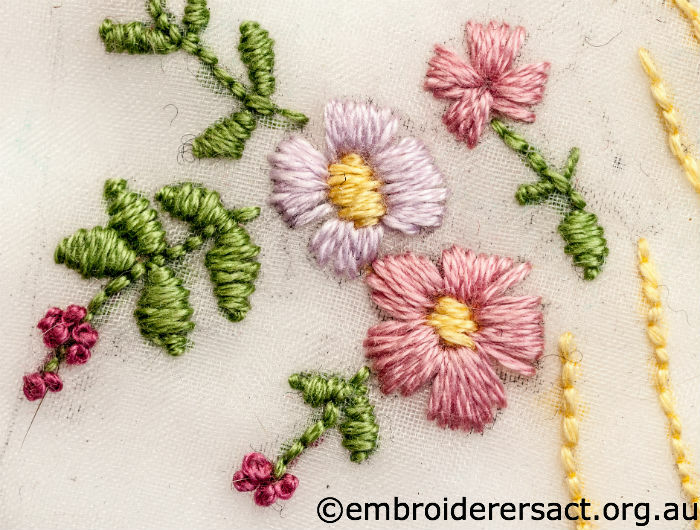 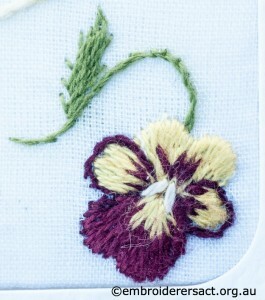 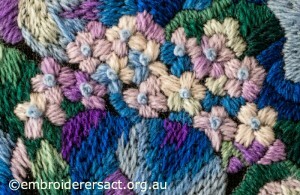 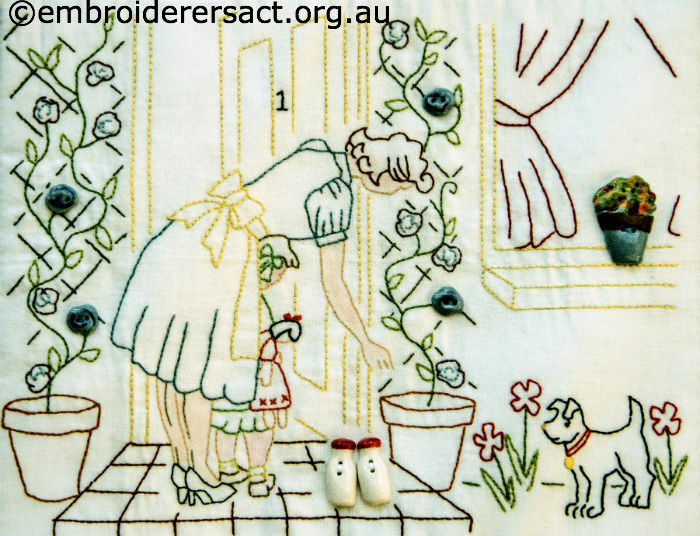 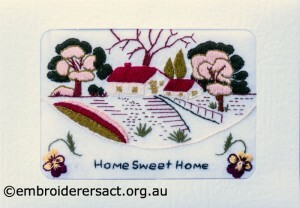 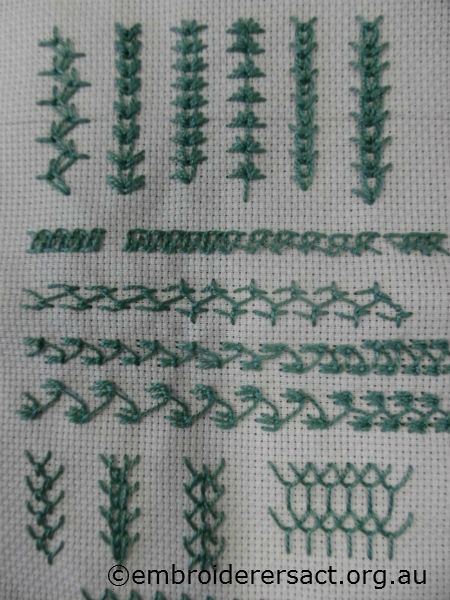 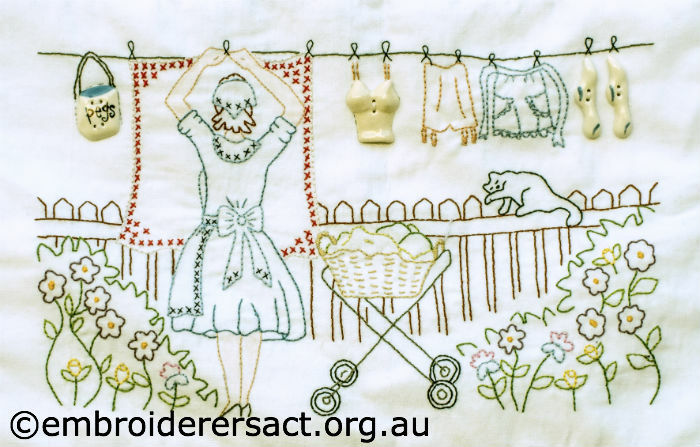 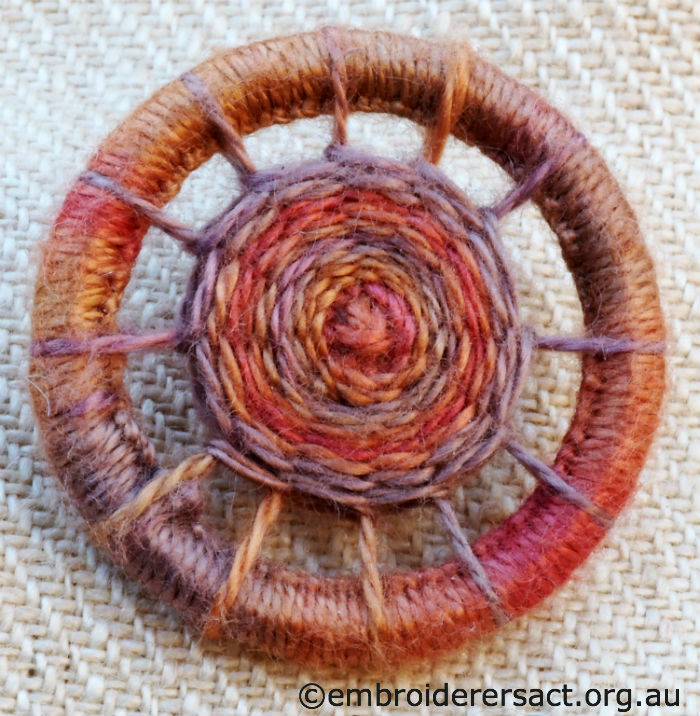 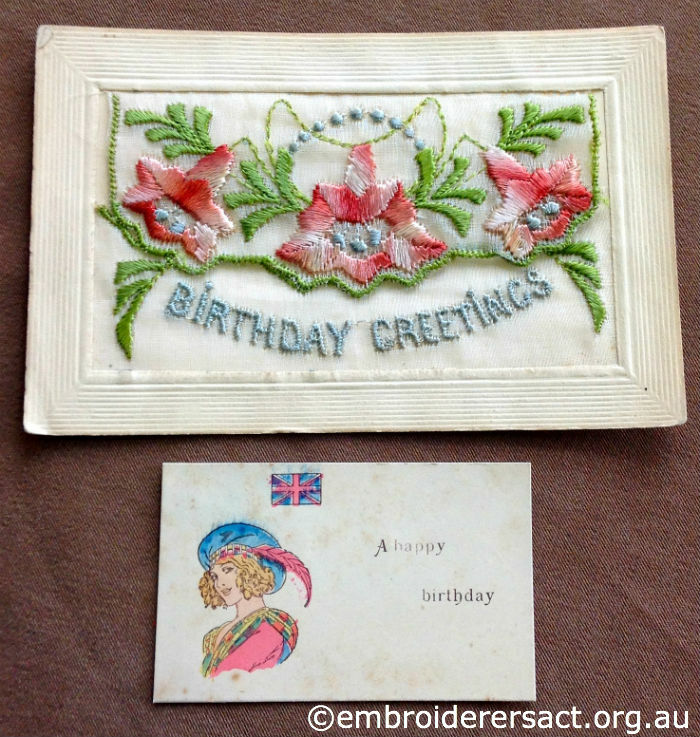 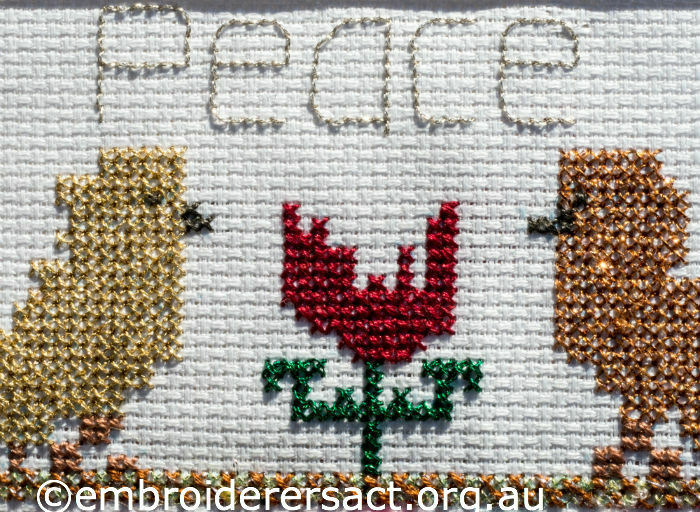 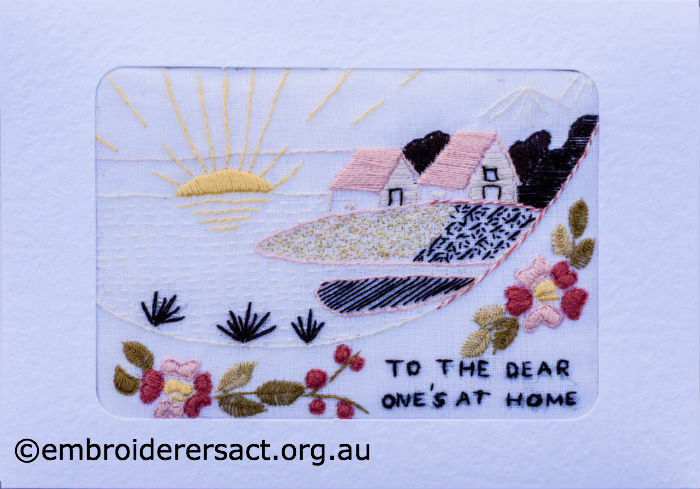 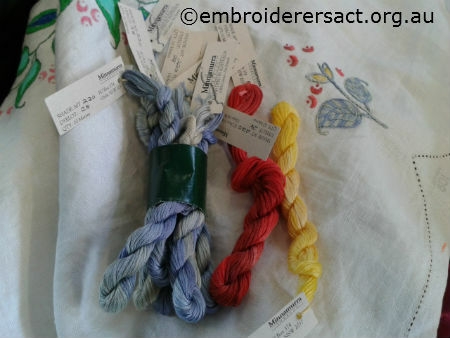 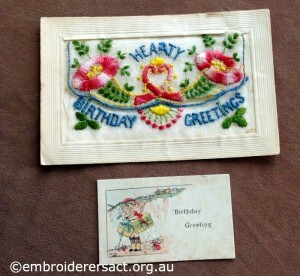 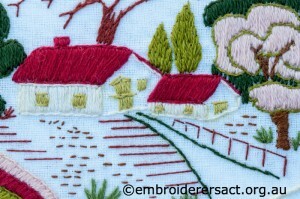 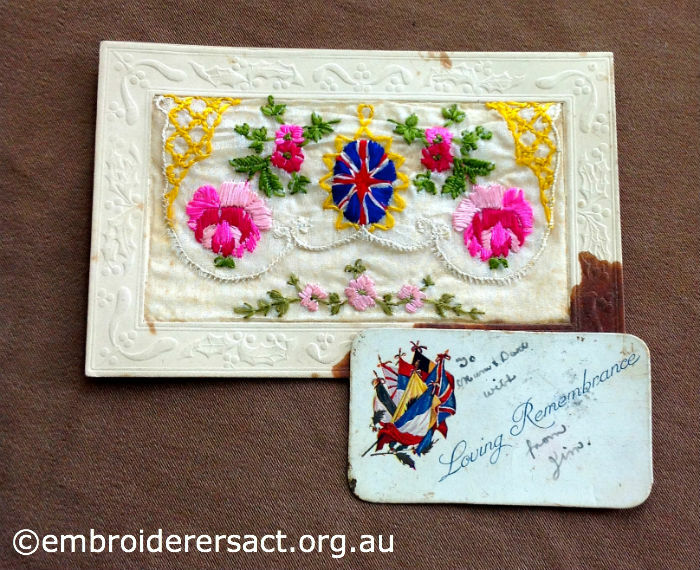 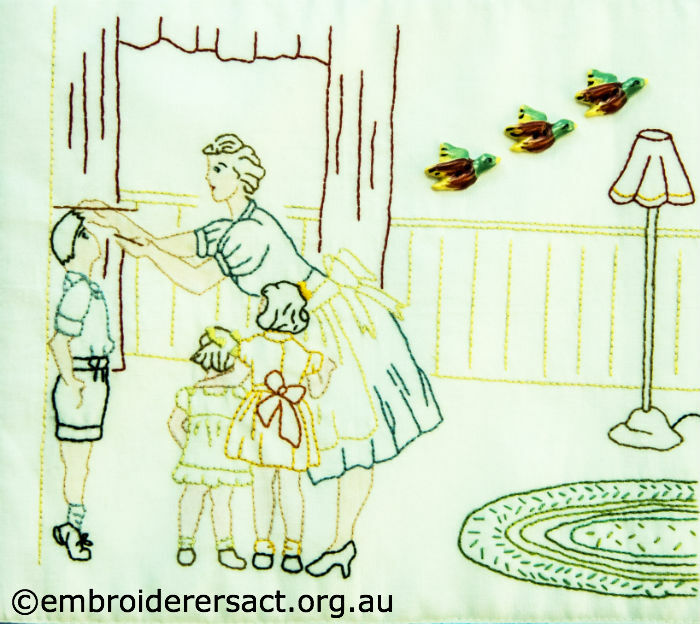 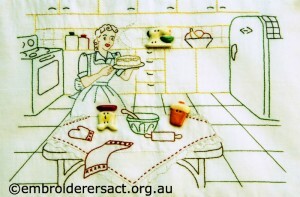 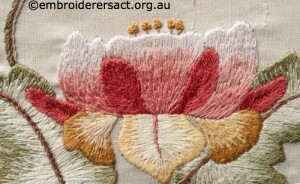 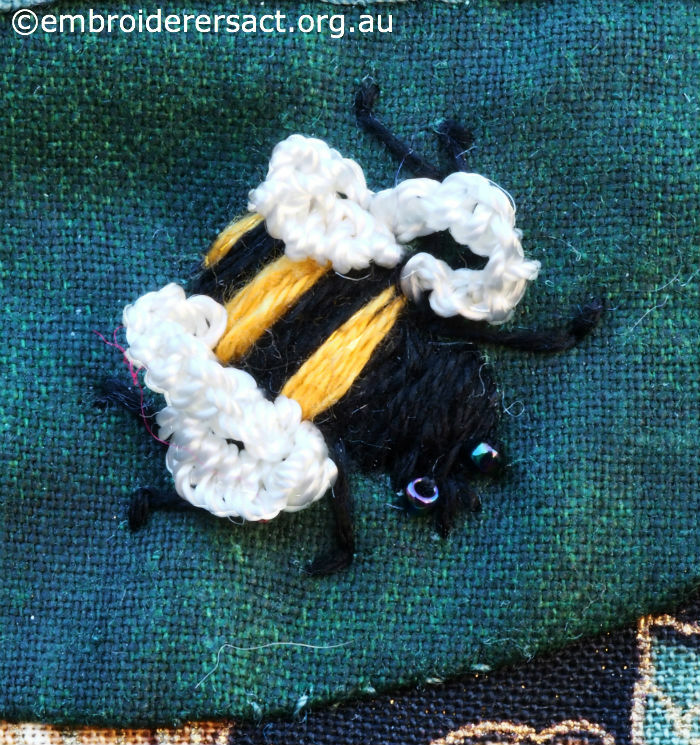 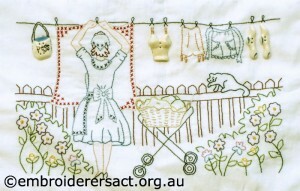 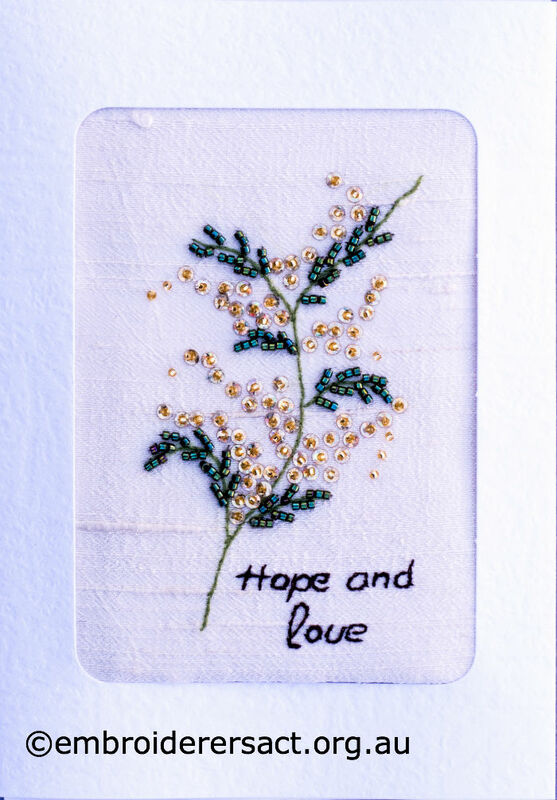 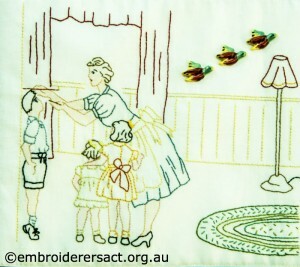 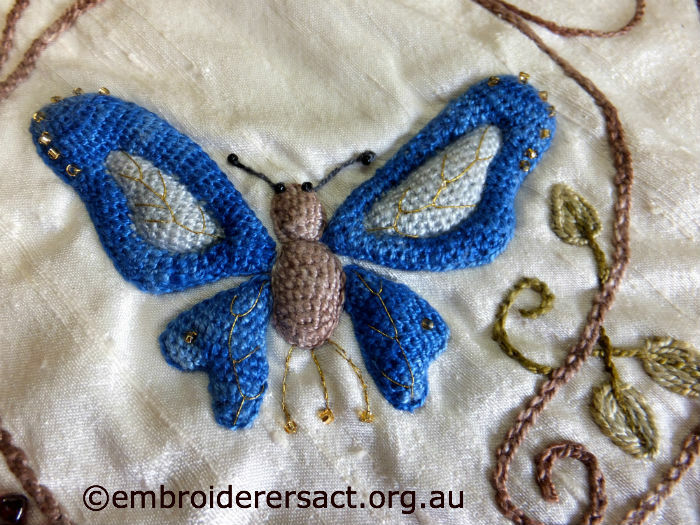 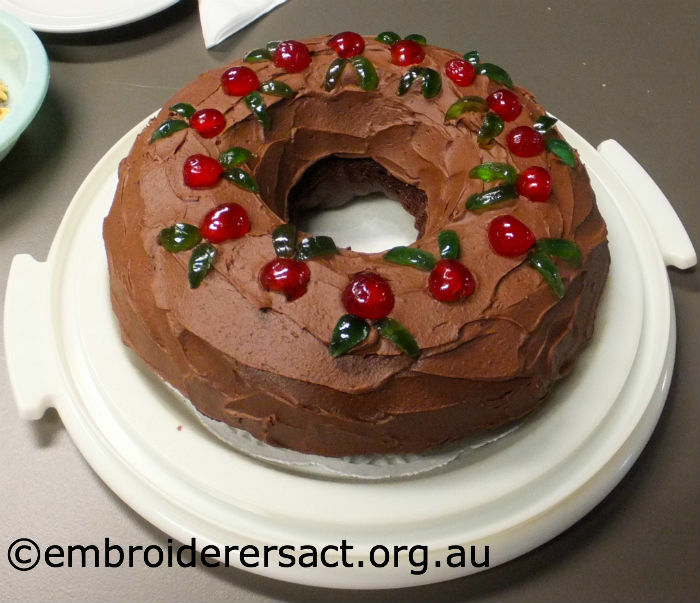 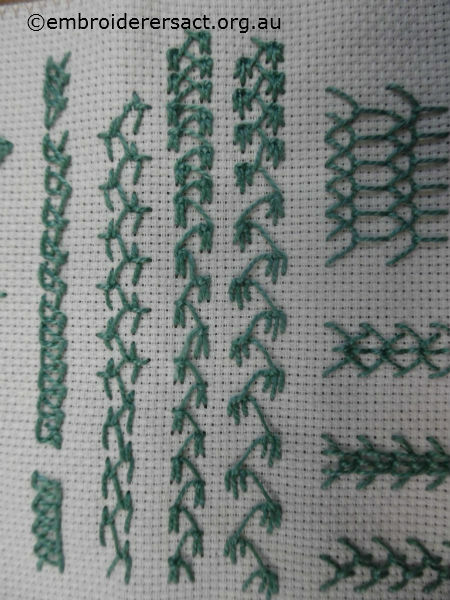 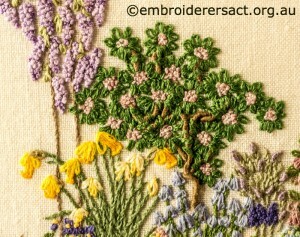 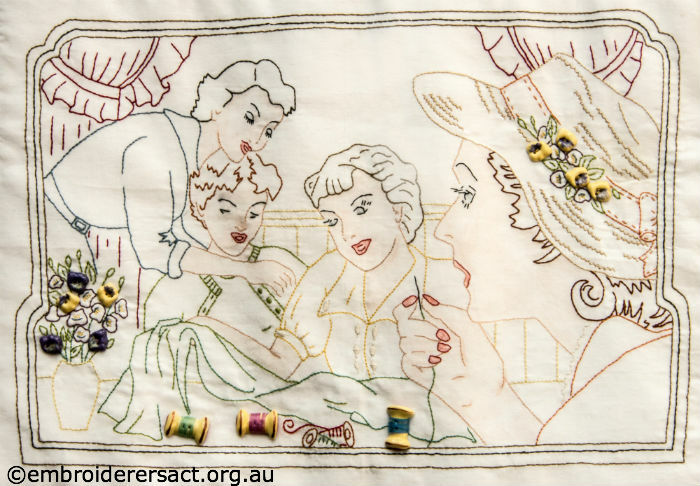 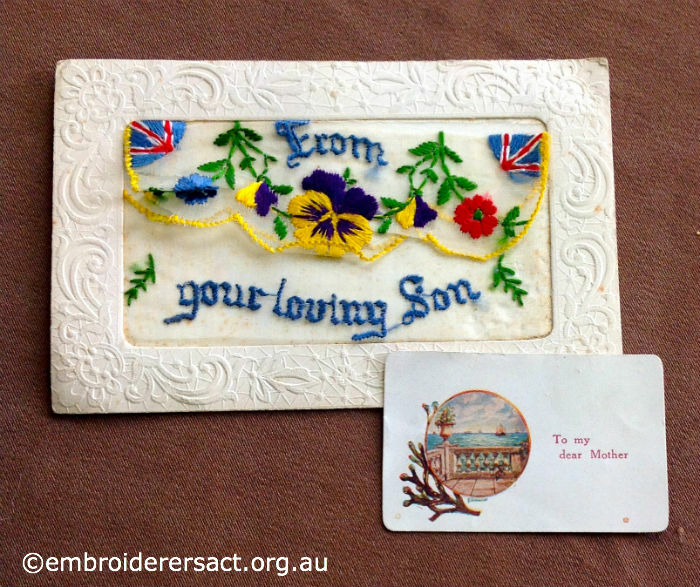 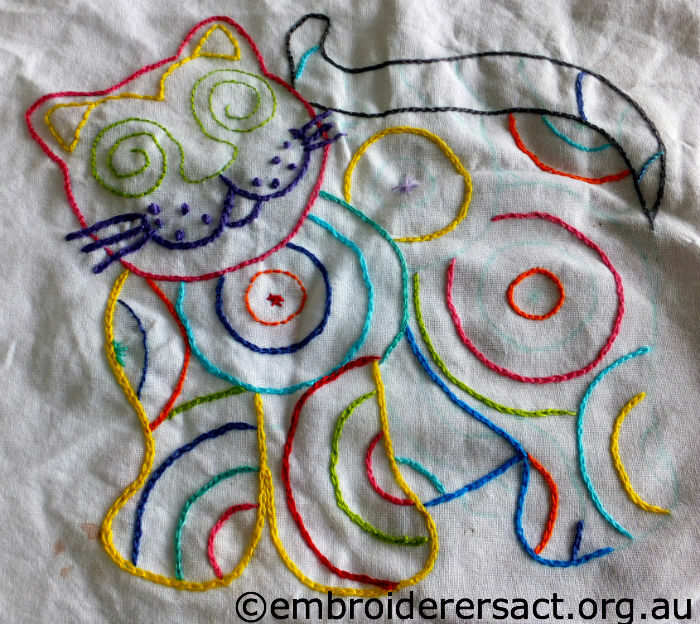 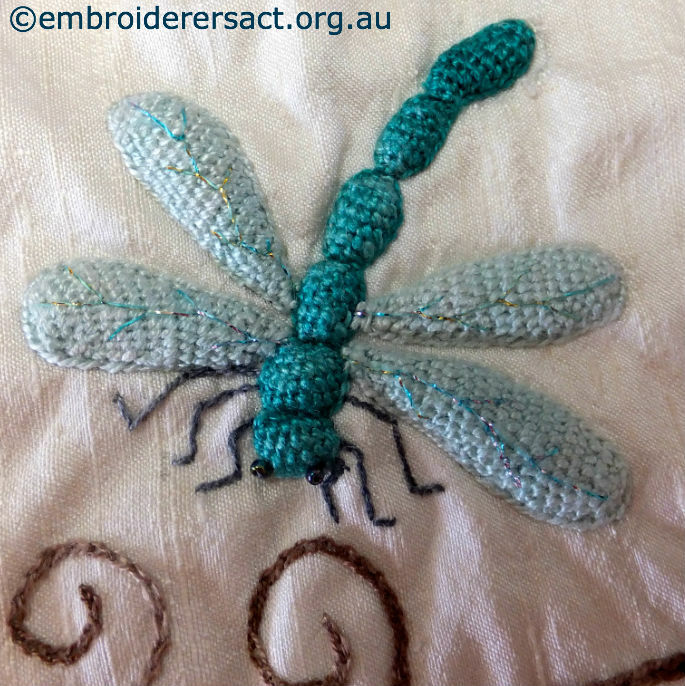 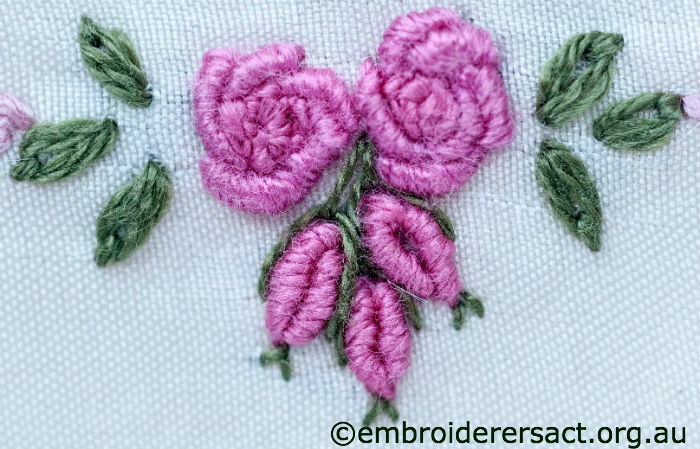 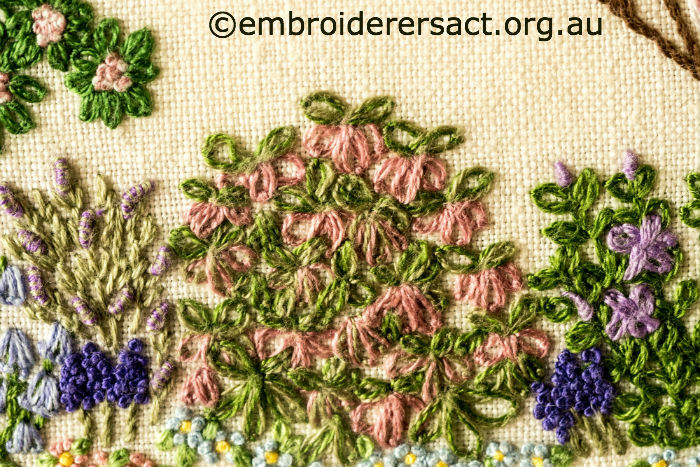 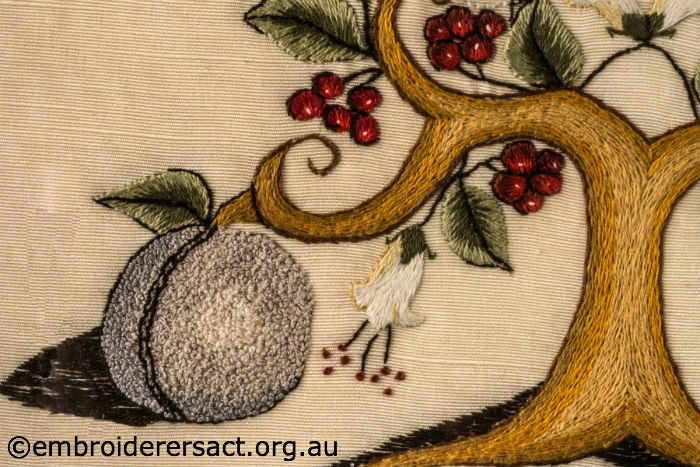 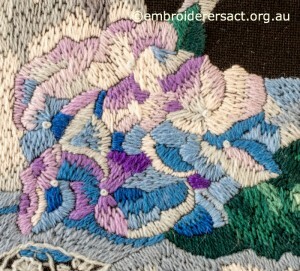 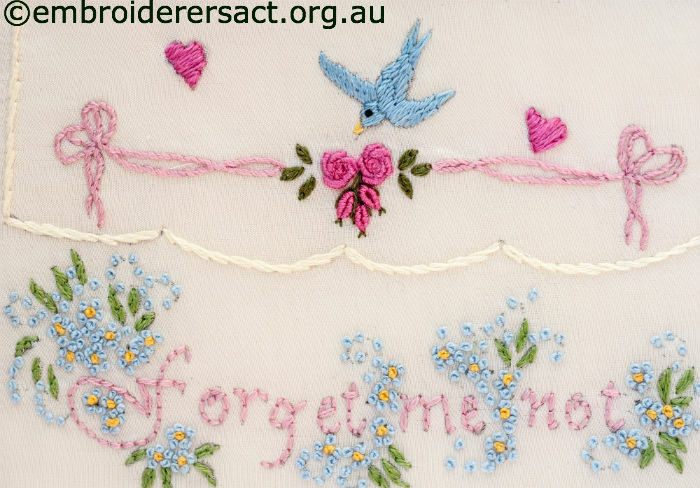 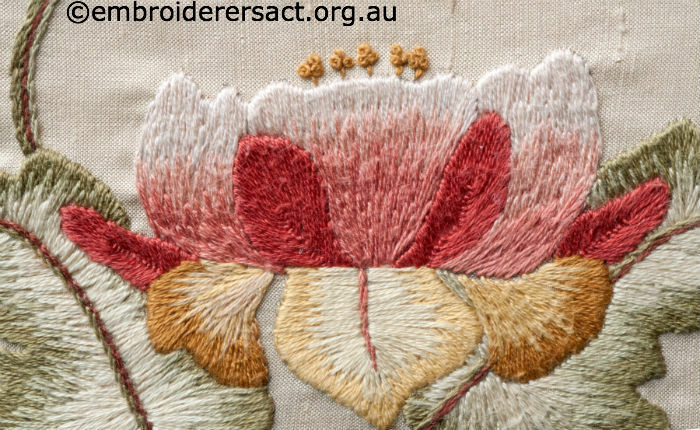 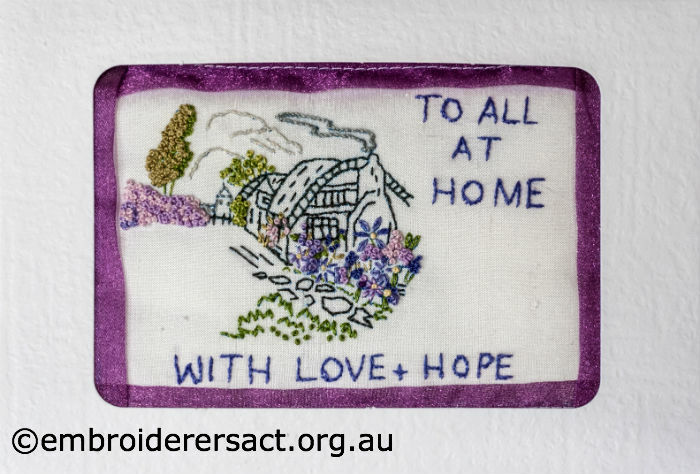 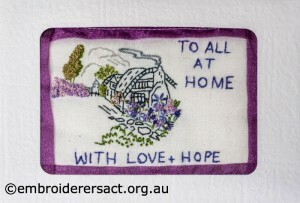 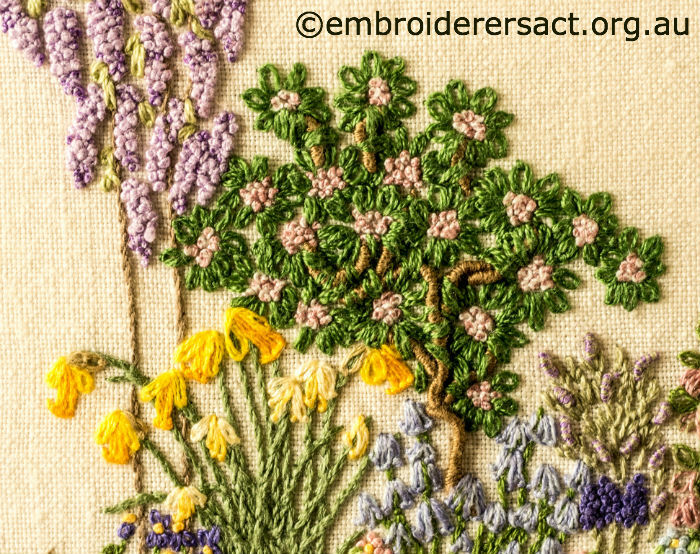 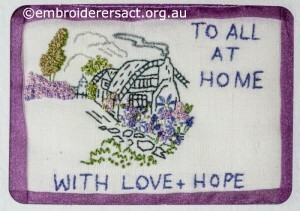 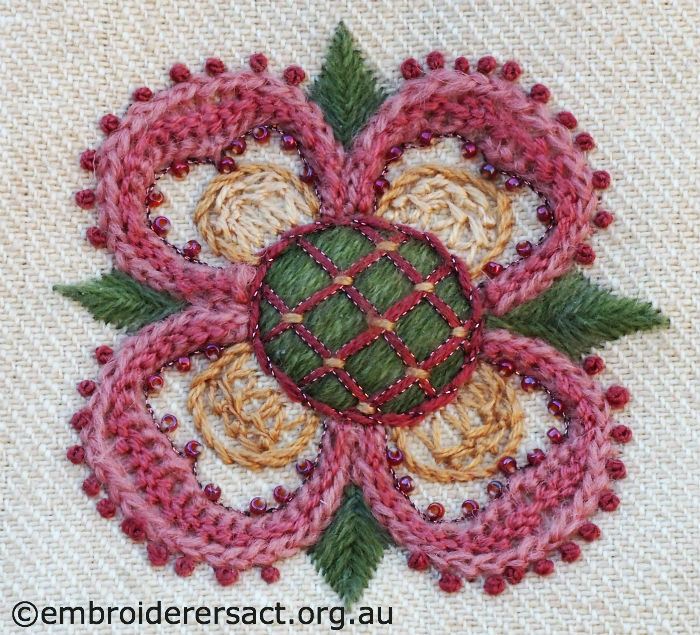 So I’ve been noticing wonderful embroideries in all sorts of spots around the house and asking (very nicely of course) when they were going to be photographed. 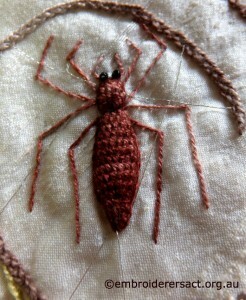 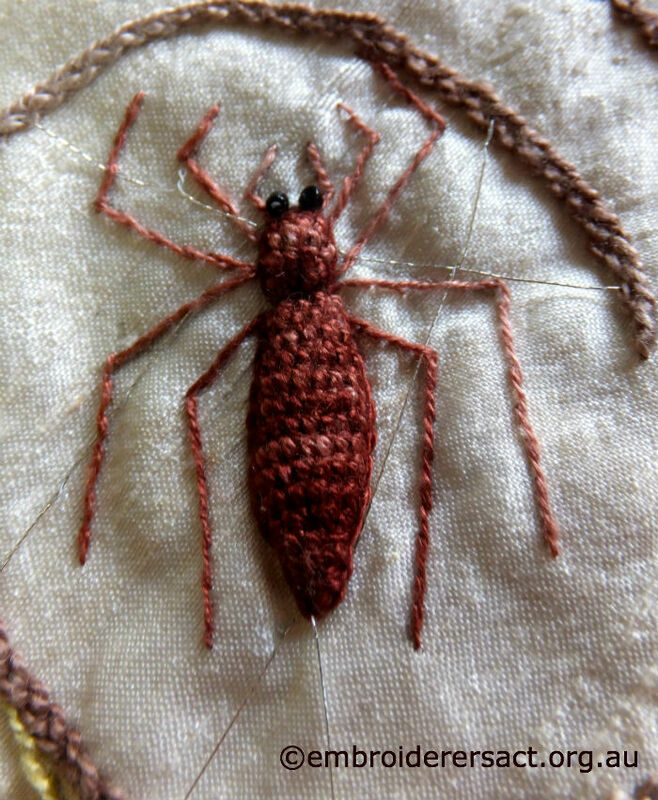 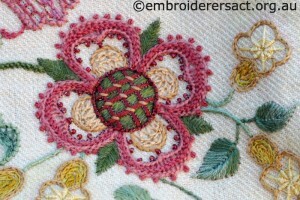 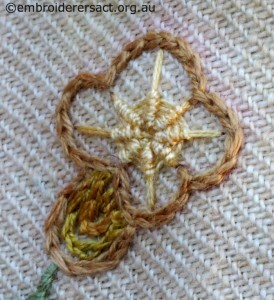 Well Yay I’ve just got my mits on a disc of photos so here’s a Crewelwork treat for you. 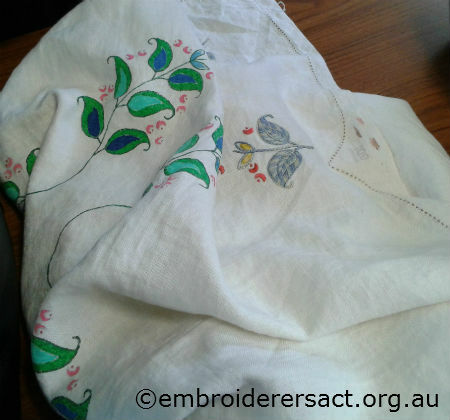 It’s a stable bag that Jillian began in a Carolyn Pearce class at Koala Conventions in 2007. 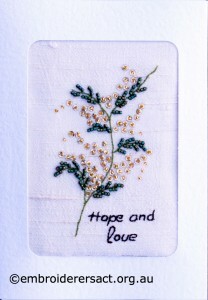 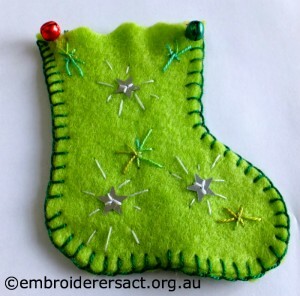 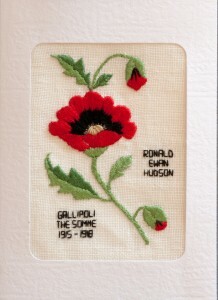 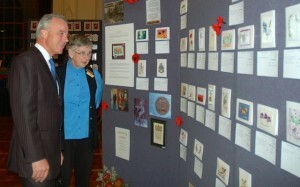 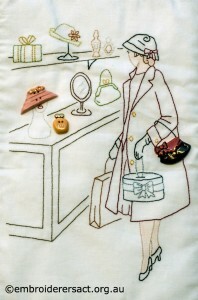 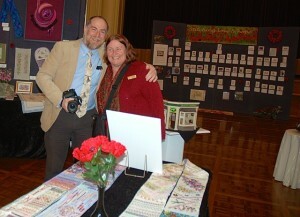 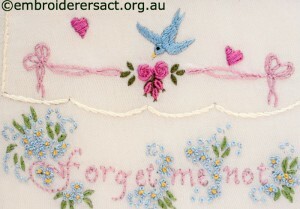 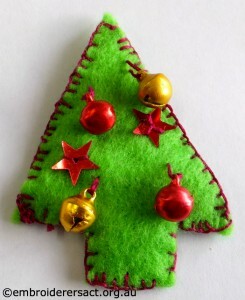 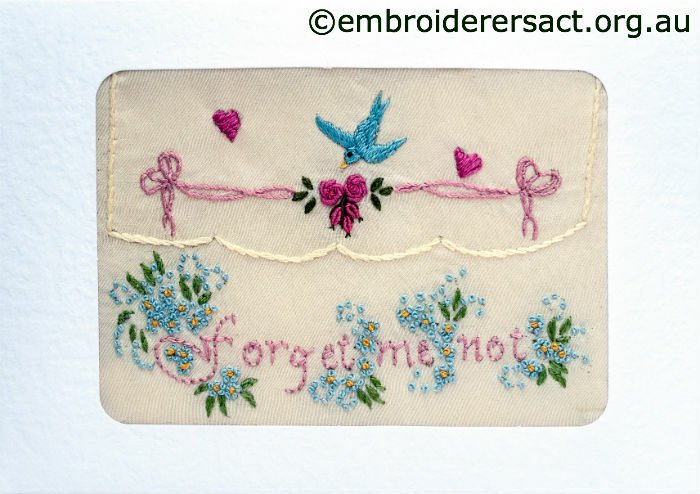 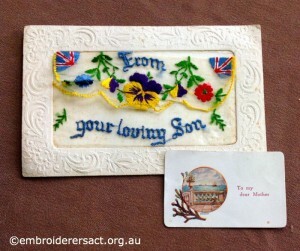 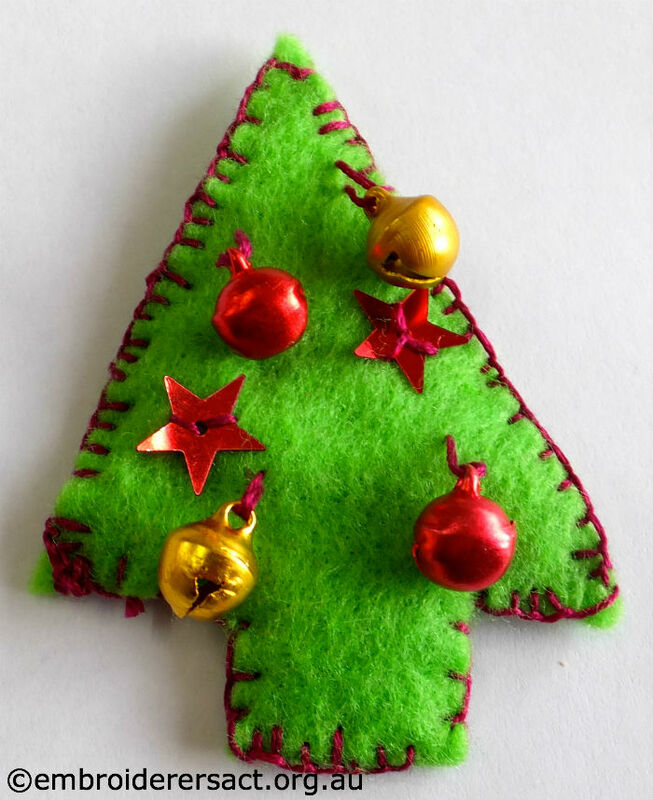 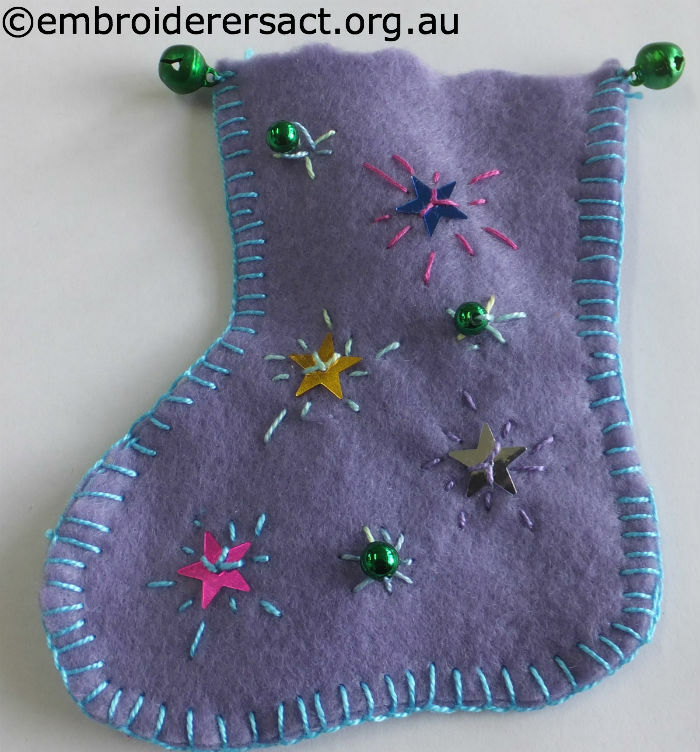 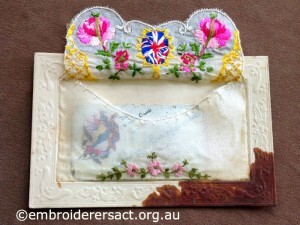 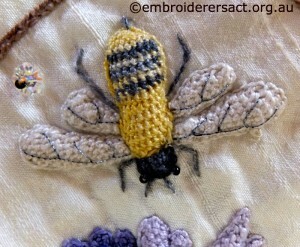 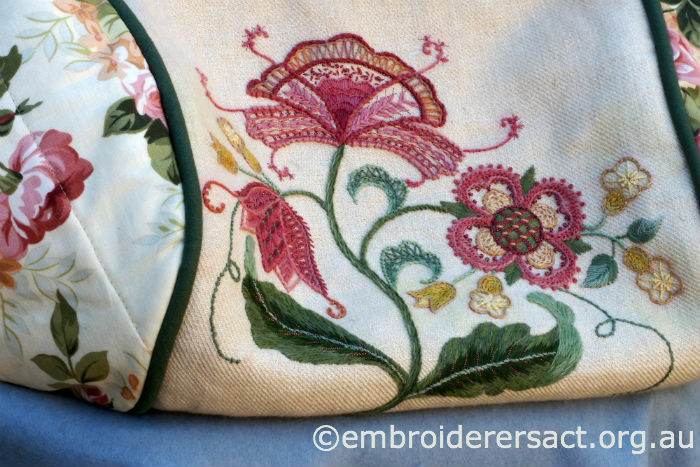 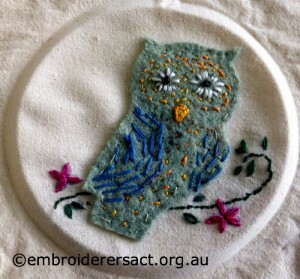 She only finished the embroidery this year and a very dear friend then made the bag up for her. 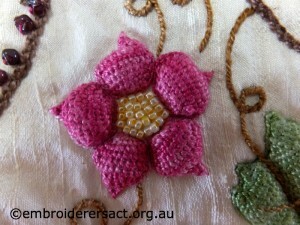 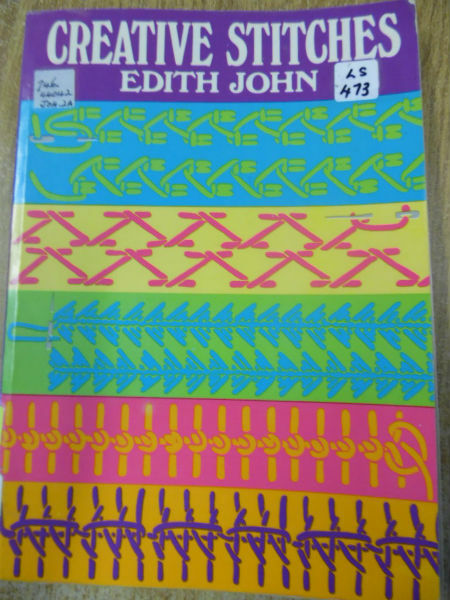 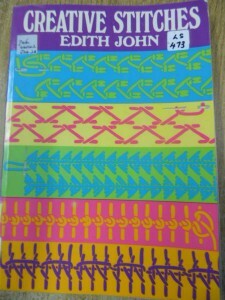 Jillian says that it was a complex and tricky job to sew it up. 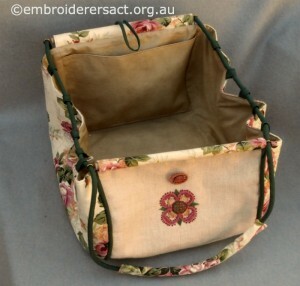 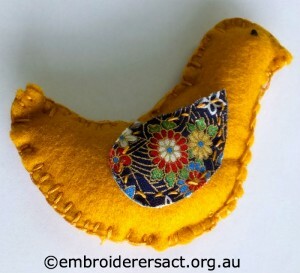 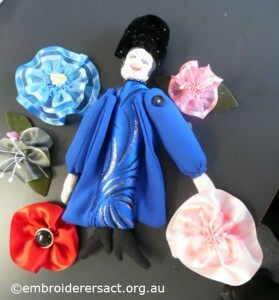 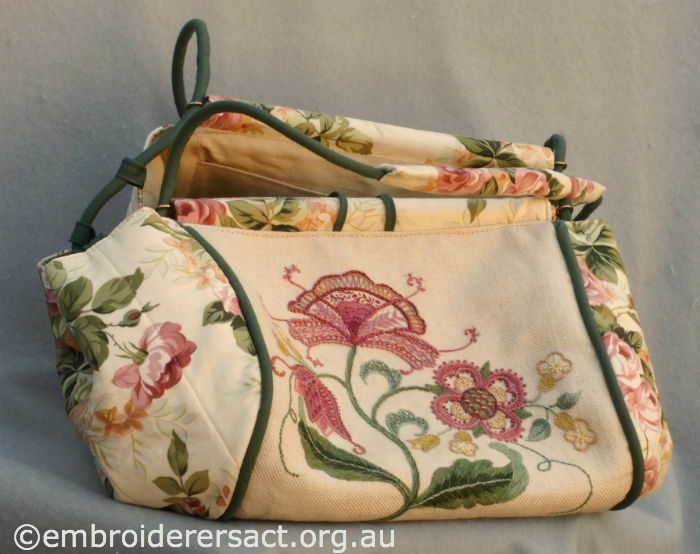 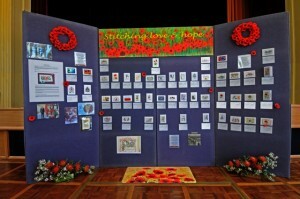 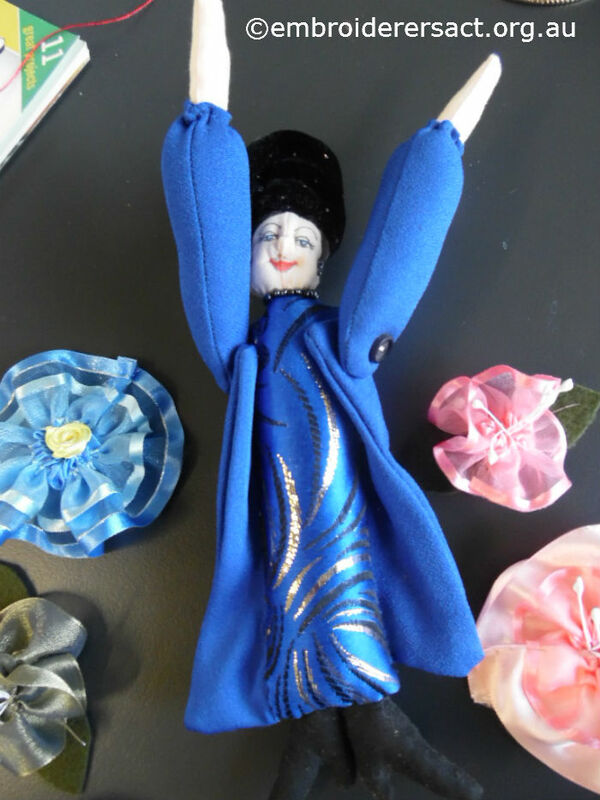 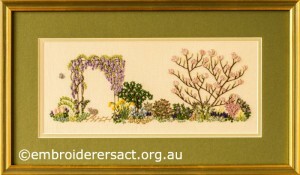 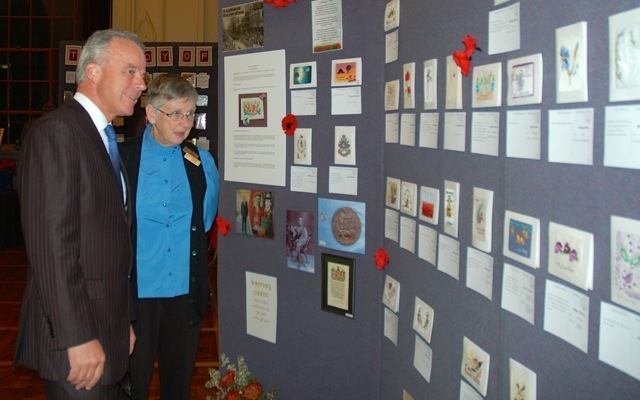 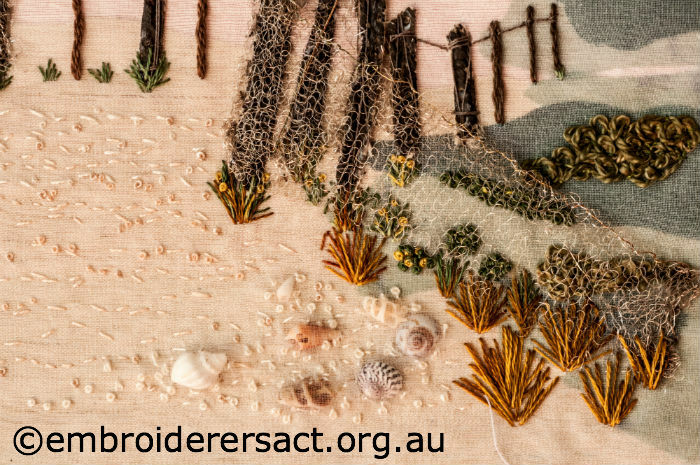 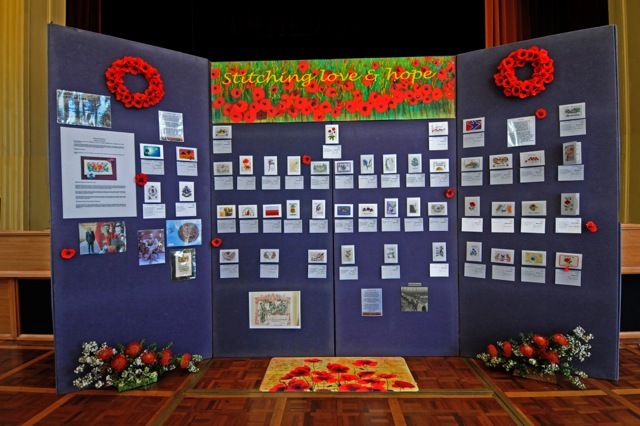 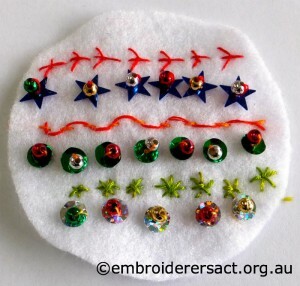 If you’re going to be in Canberra next weekend for Floriade or any other purpose then you might want to also rock along to the Guild’s Annual Exhibition at the Albert Hall and get to see Jillian’s stable bag in all its specialness. 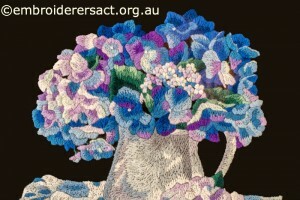 It’s on from Friday the 19th to Sunday the 21st of September from 10.0 a.m. to 4.o p.m. each day. 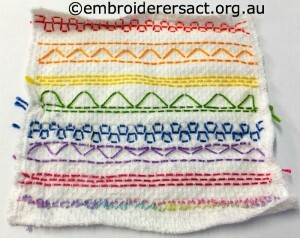 For those of you who are fans of Sharon Boggon’s amazing Pintangle blog you’ll be able to see her Band Sampler at the Exhibition. Beyond exciting no? 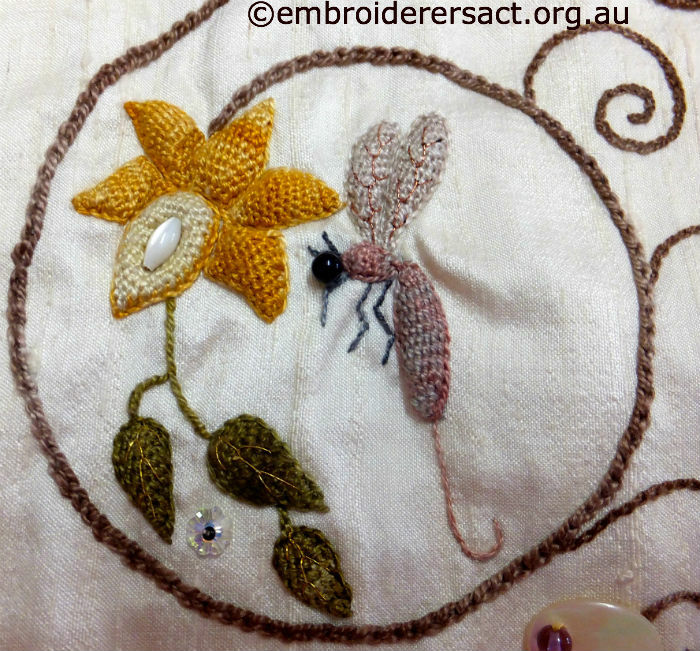 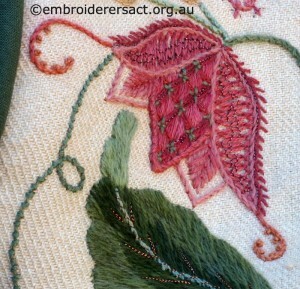 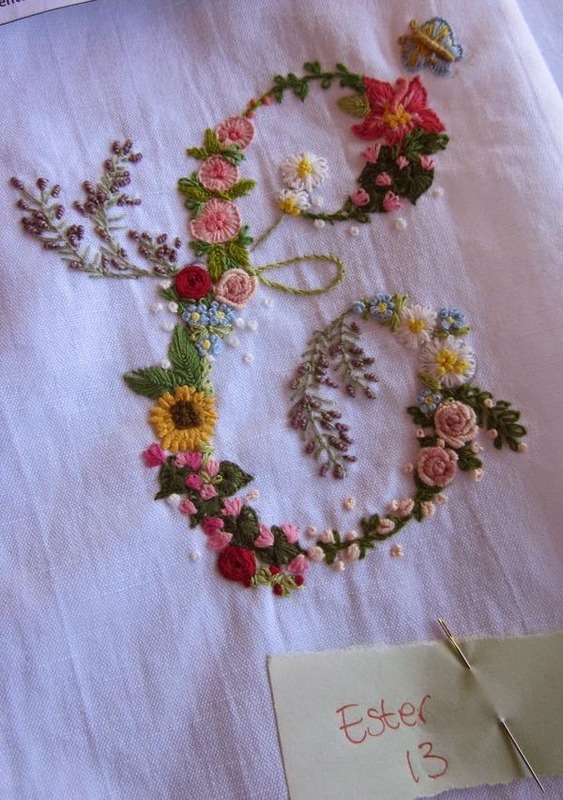 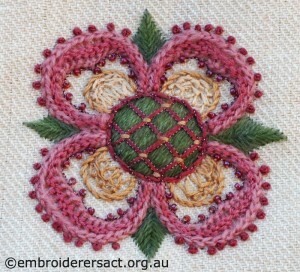 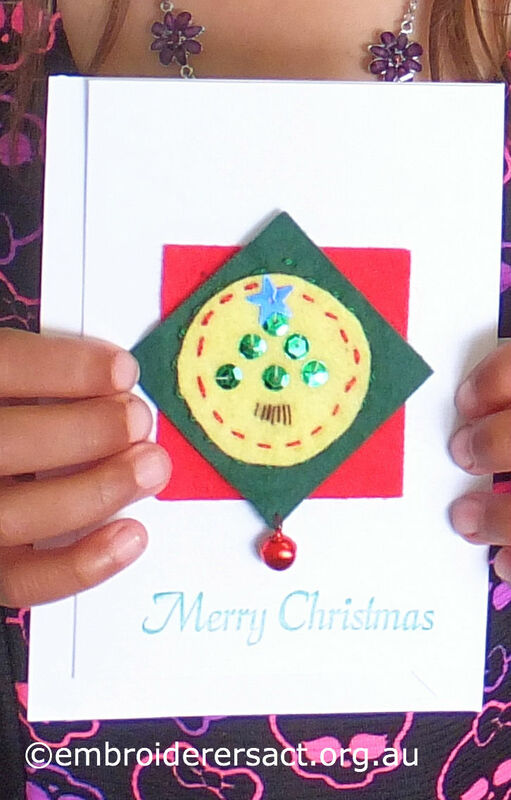 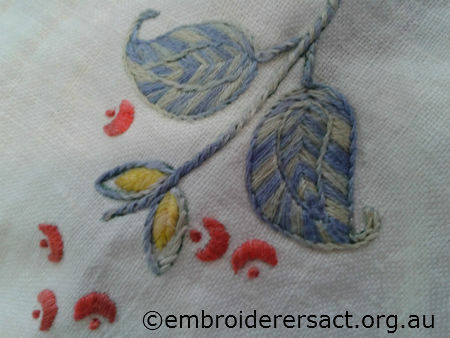 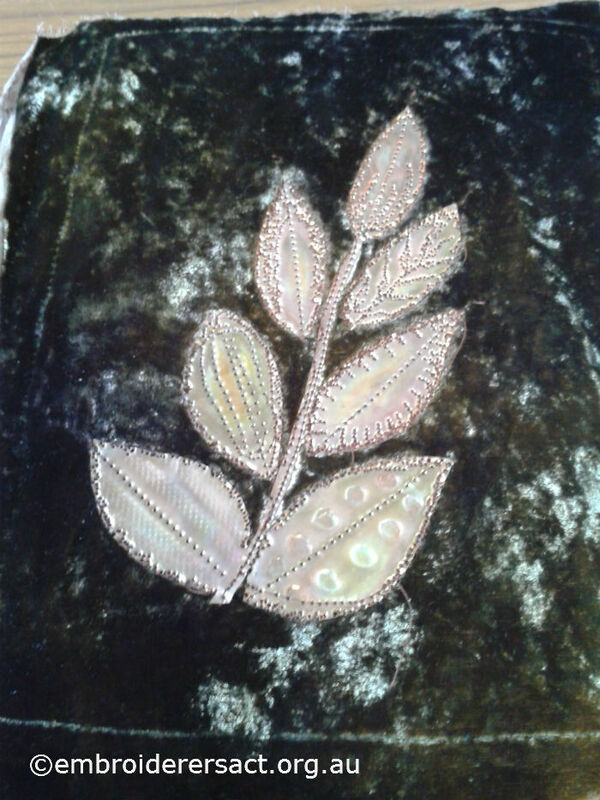 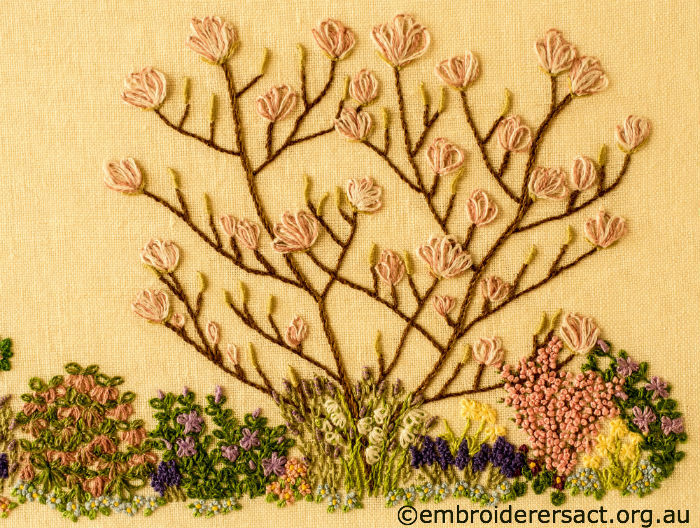 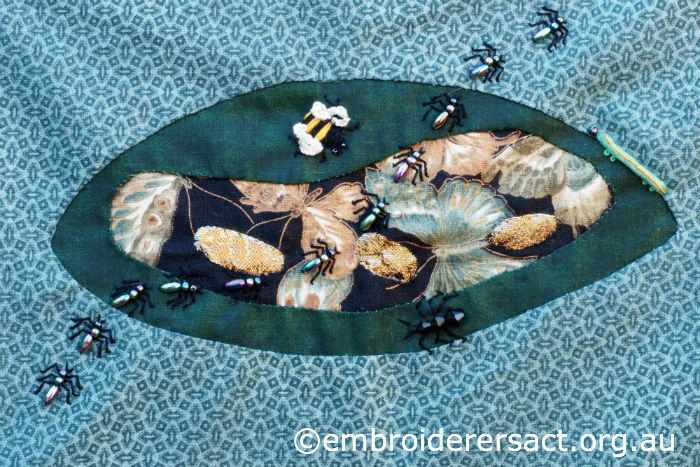 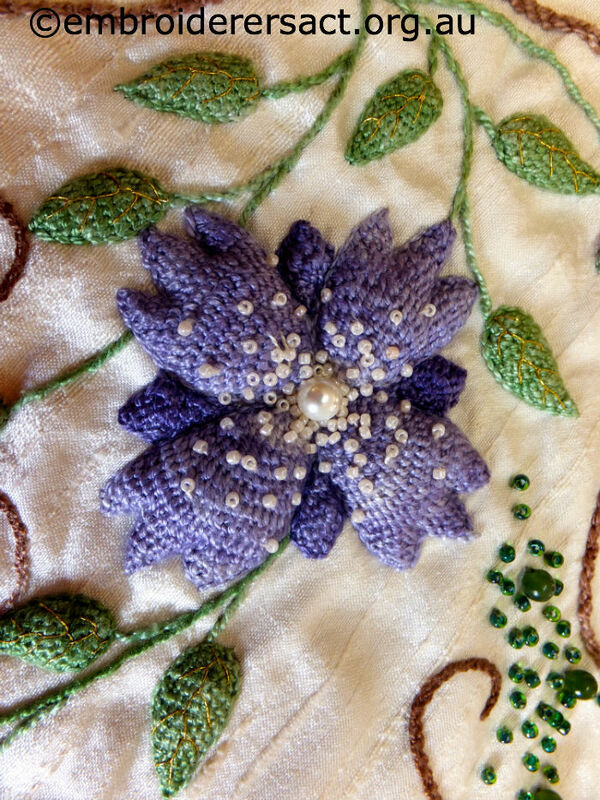 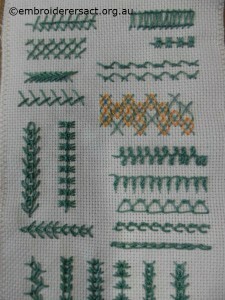 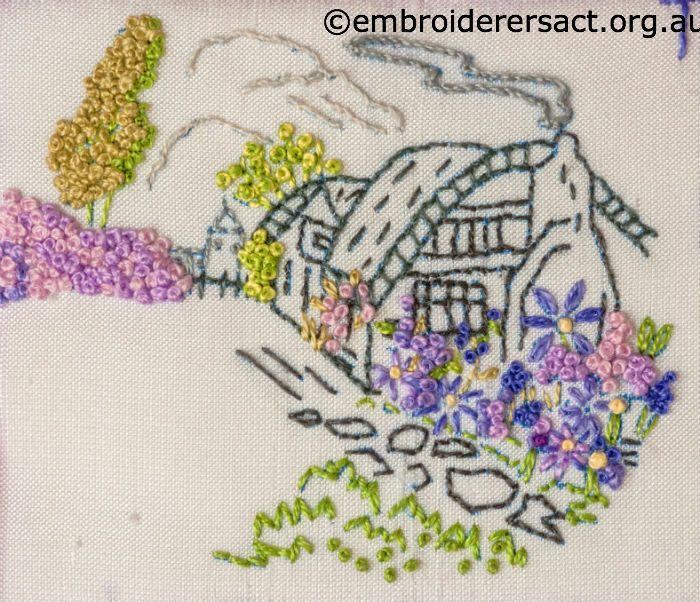 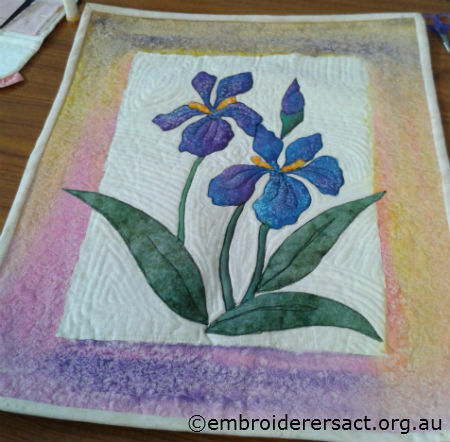 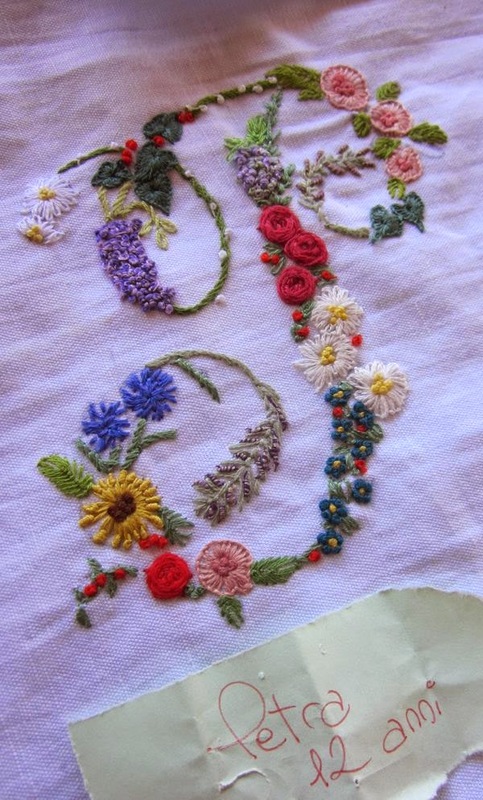 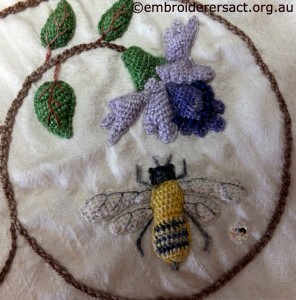 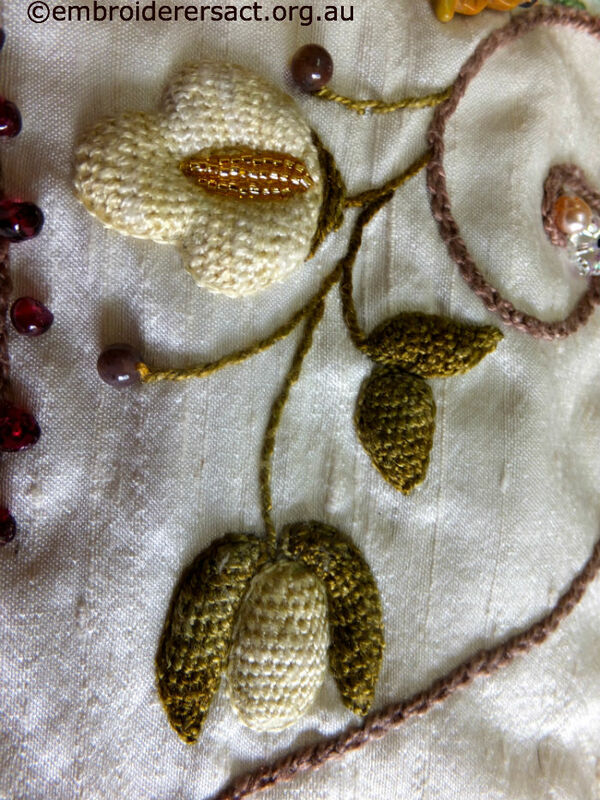 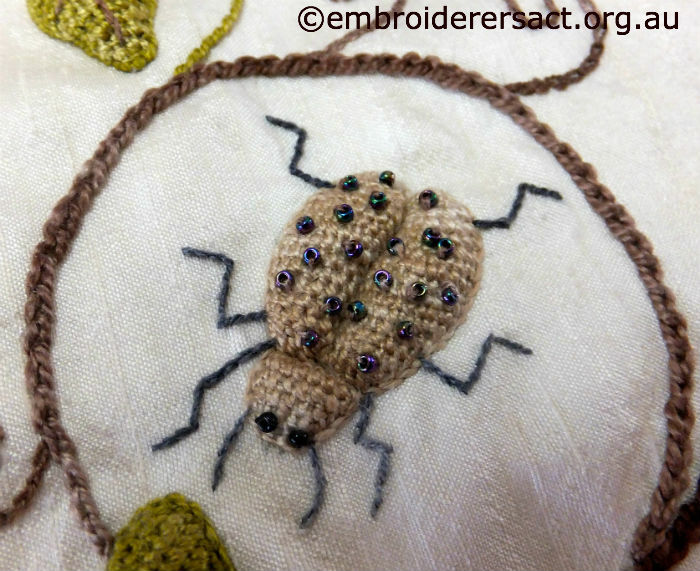 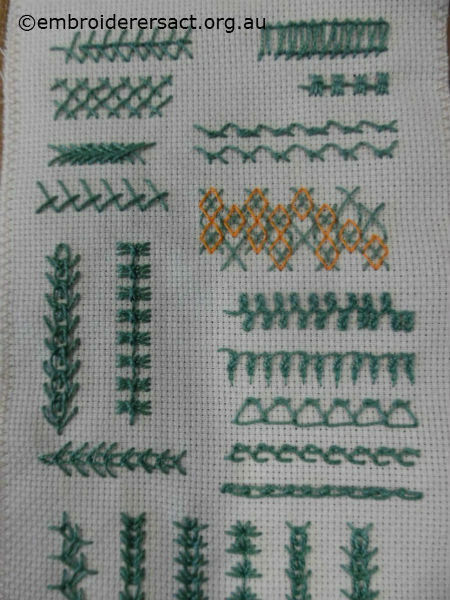 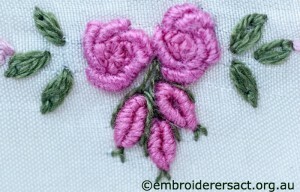 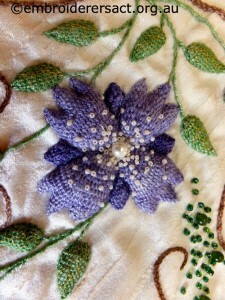 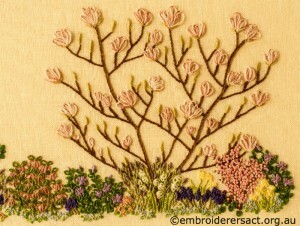 Jillian thank you so much for sharing this Crewelwork delight with us.